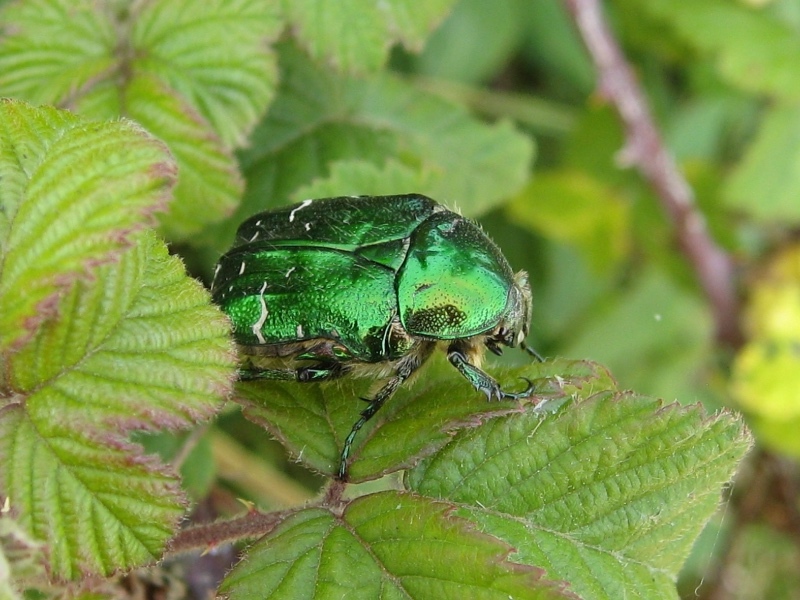 Here are some of our photographs of the Insects and Spiders found on Stanpit Marsh. Click on the photo for an enlargement. 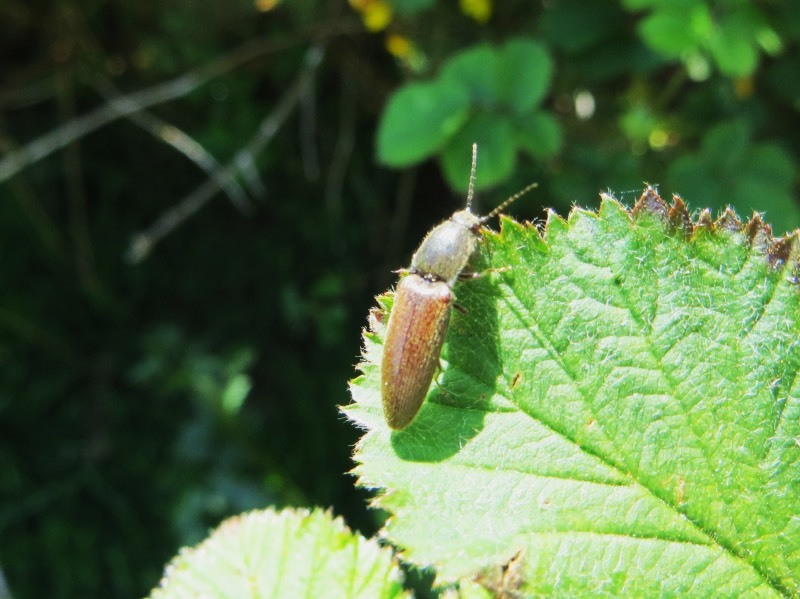 Alongside each picture we include some facts about these creatures that are found on the marsh. All photographs were taken by members of FOSM. We add more photographs frequently, so please check back regularly. Recognised by its thin coat and rather scruffy appearance. 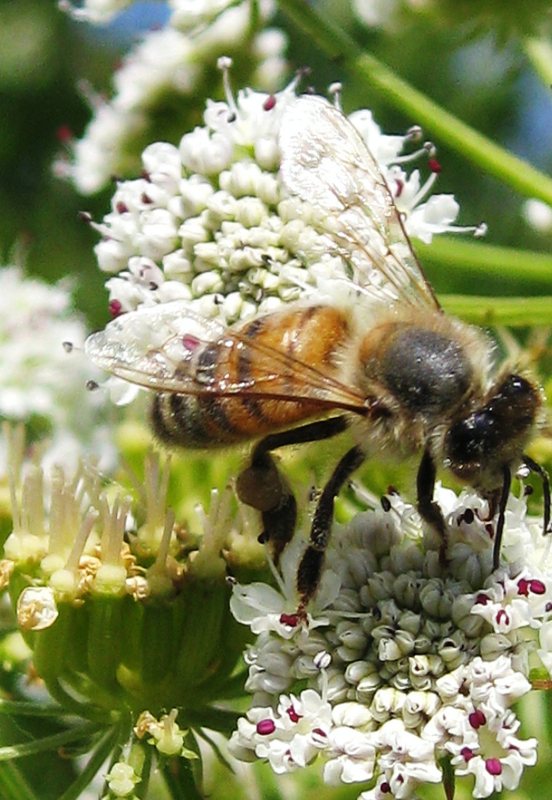 A common, sociable bee, living in colonies. 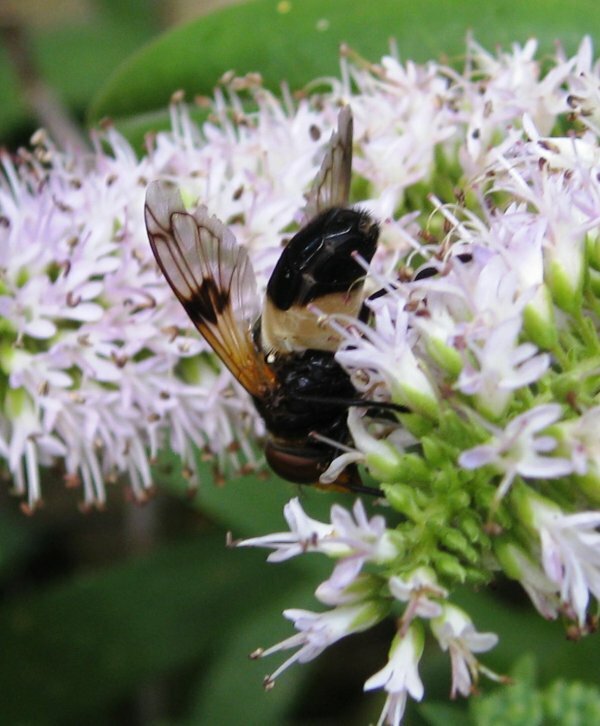 It feeds on nectar, and produces a small amount on honey for feeding in bad weather. It nests underground or in grassy tufts. 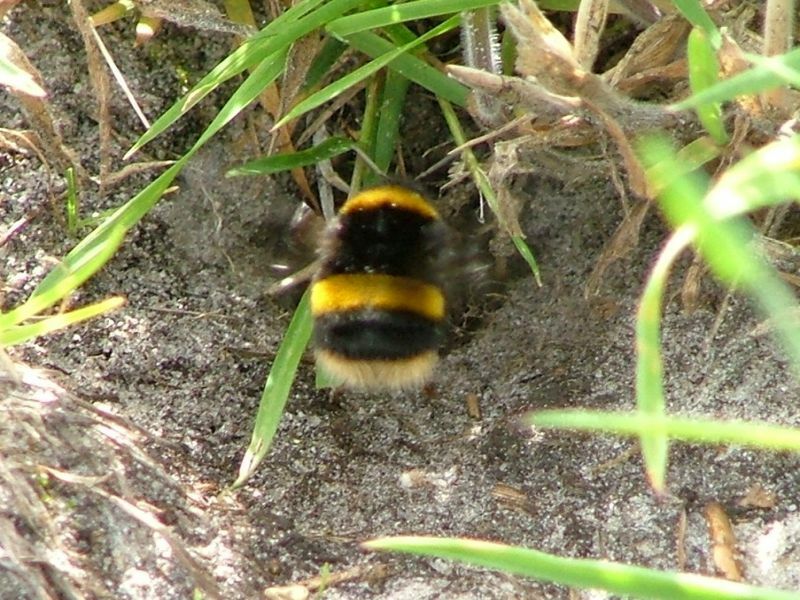 New queens are produced in late summer/autumn and out of the whole colony only these bees survive the winter – forming a new colony in the spring. Comment from photographer: I'm not sure whether the Chaffinch paused before flying with food for young, because we were nearby or because he was concerned about the bees! Such swarming of bees occurs when (upon the birth of a new queen in the nest) the old queen bee leaves - taking with her half of the workers - and searches for a new nest site. This particular swarm hung on this tree in North Scrubs for several days before a 'scout' bee must have found somewhere suitable. This was photographed at nest entrance in turf of North Scrubs. They nest deep in the ground, sometimes as deep as 1 metre. They also sometimes take over empty mouse or mole holes. The nest is lined with dry grass and moss. Larvae live under loose tree bark, and prey on small creatures living there. 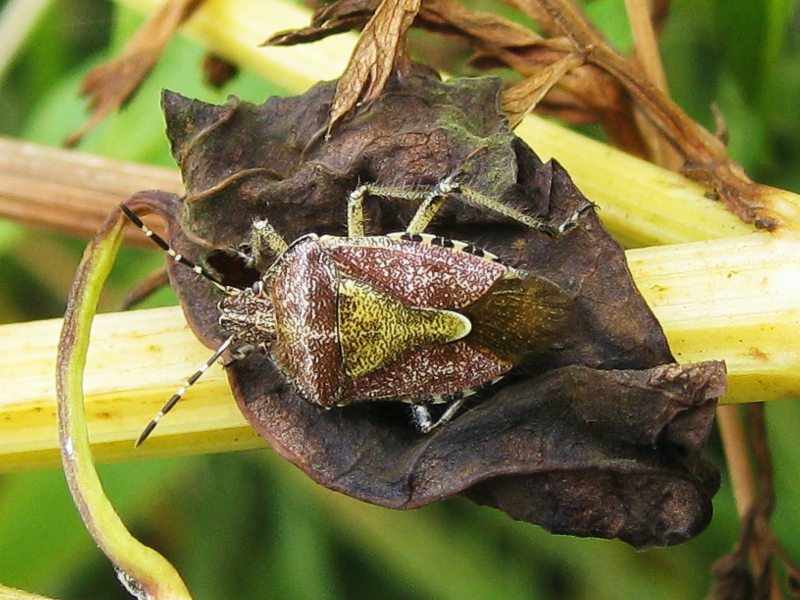 Where seen on marsh Dense vegetation, particular North Scrubs. Likes sub-bathing! Adults feed on Fruit & seeds. Feed on dock and related plants. 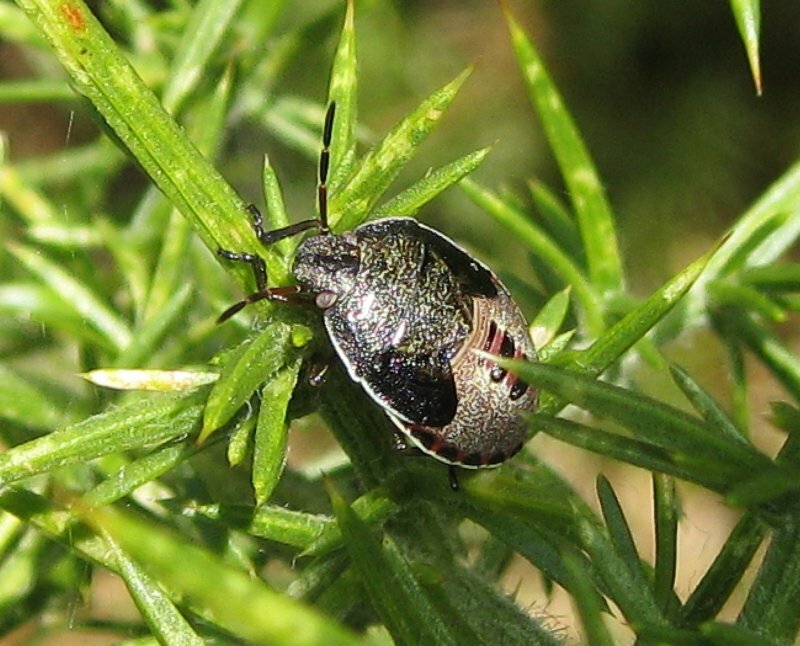 All shieldbugs have several skin-changes - known as Instars - before becoming adults. Lavae They feed on roots and live up to 4 years. 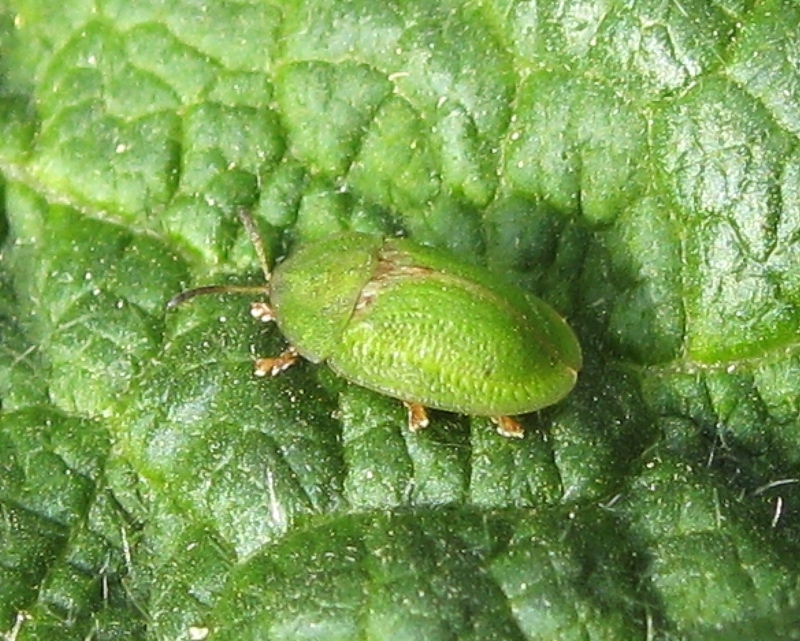 This species is very common and widespread throughout the UK. 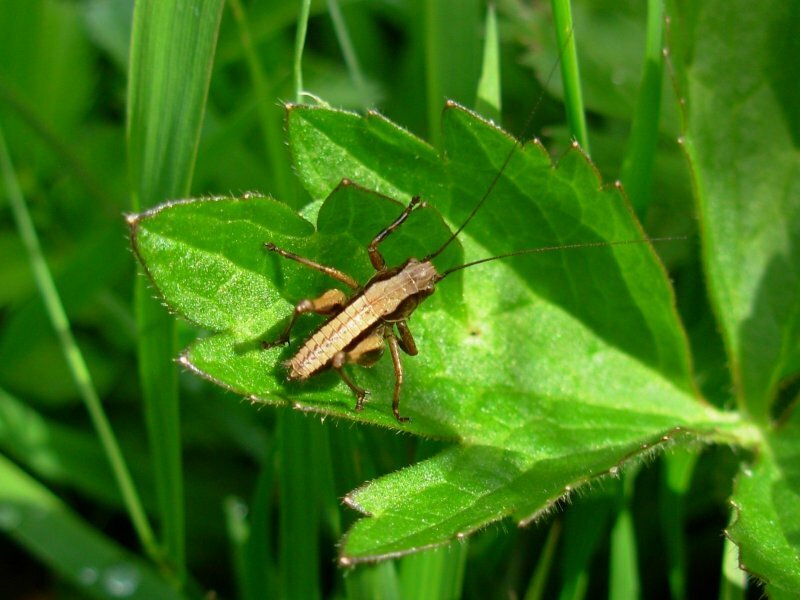 Click beetles (also known as Skipjacks) have a special technique to escape from danger. 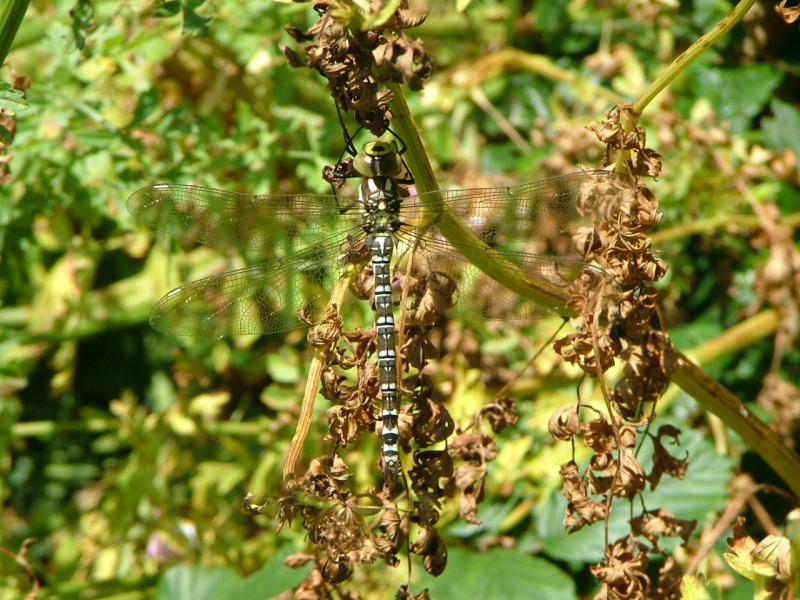 They have a hinge on their thorax, and by arching their body they create a tension on the hinge, like a coiled spring. The tension can be suddenly released, catapulting the beetle into the air at a speed of more than 2 metres per second. They make a click sound when this happens. They don't always land on their feet so might have to repeat the process several times until they do. Only male has swollen legs. 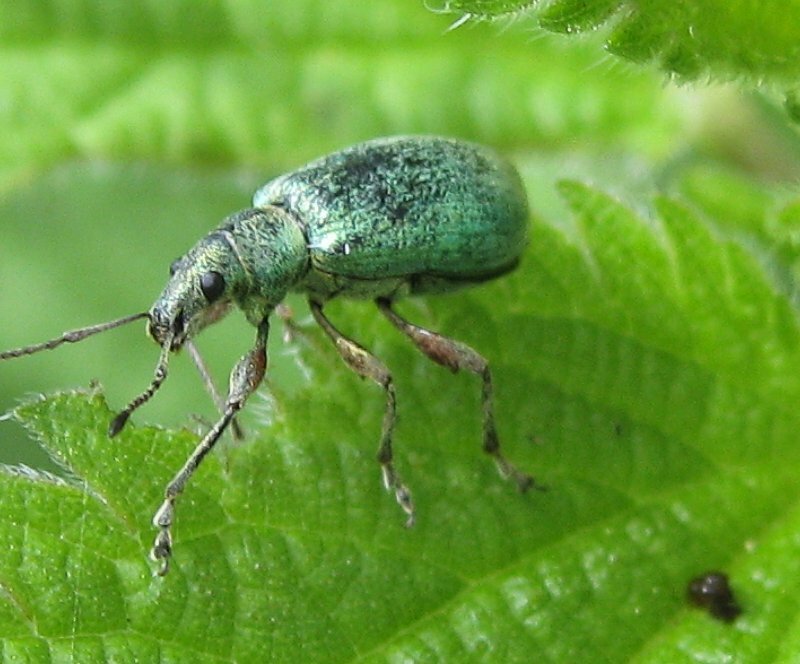 Flea beetles are so named as they have enlarged legs for jumping away from danger. 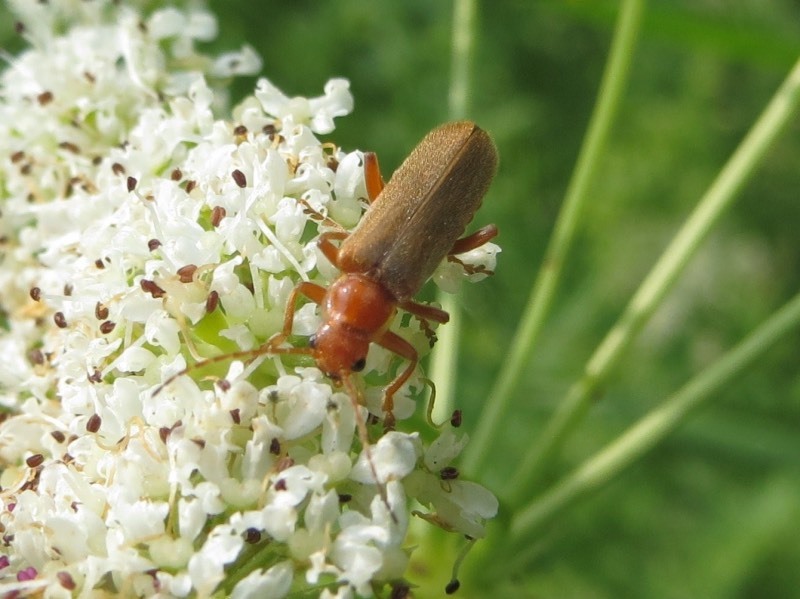 This is the most common Soldier beetle in the UK. 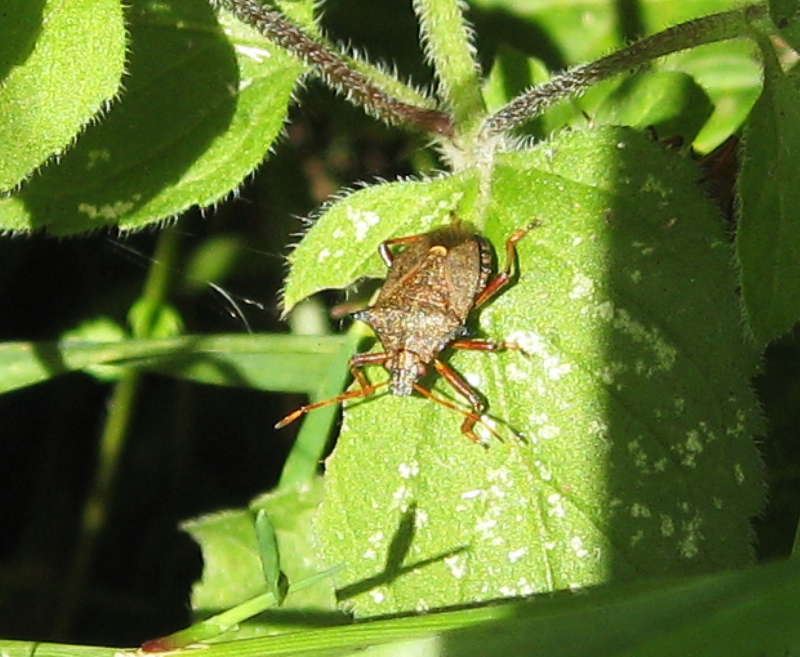 They are often called 'bloodsuckers', but are actually quite harmless. 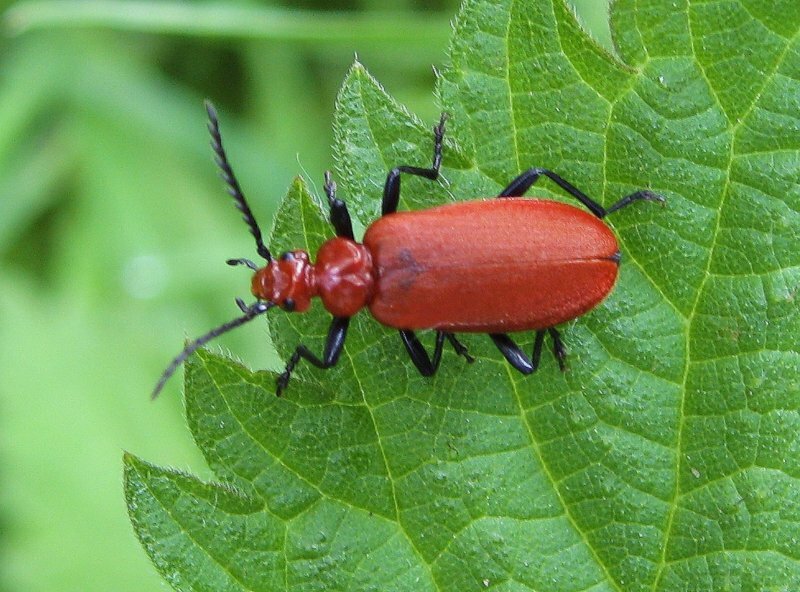 The adult beetle is strikingly attractive. 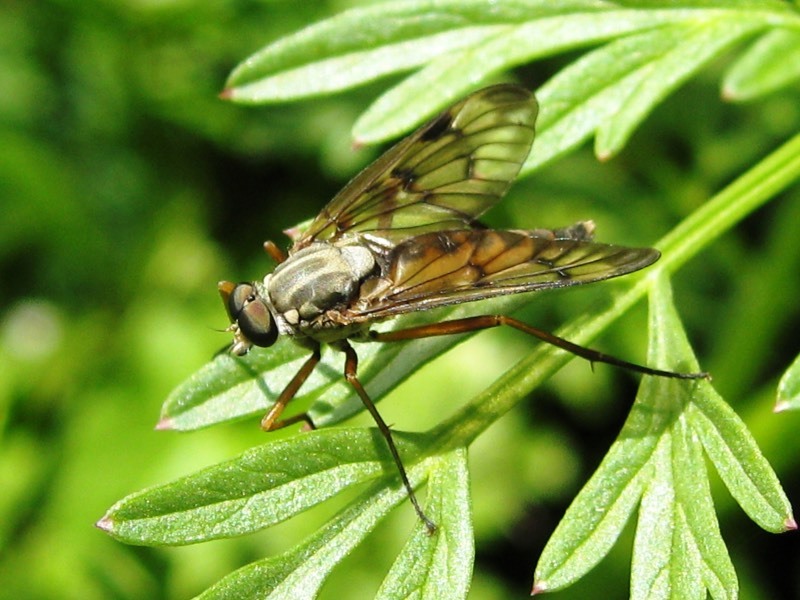 Although rather cumbersome when moving about in vegetation, it is actually a fast flyer. They are particularly fond of roses, and often eat the petals. Eggs are laid in the spring, in compost, leaf-mould, or rotting wood, and the larvae feed on the decaying matter. They pupate in June/July and emerge as adults the following Spring. The adult is a flightless predator, and lives in damp decaying matter near marshes and river banks. They are more active at night when they emerge to search for food. The eggs are laid near water in decaying litter. 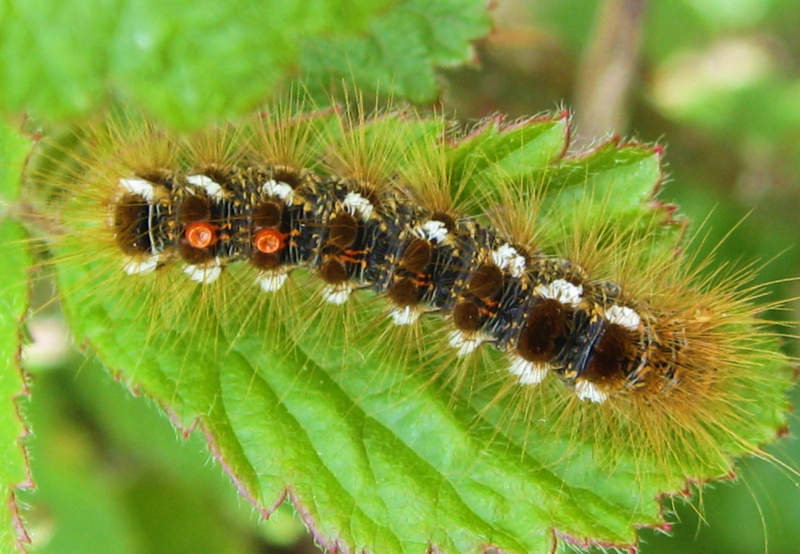 The larvae feed and moult within the litter until ready to pupate. 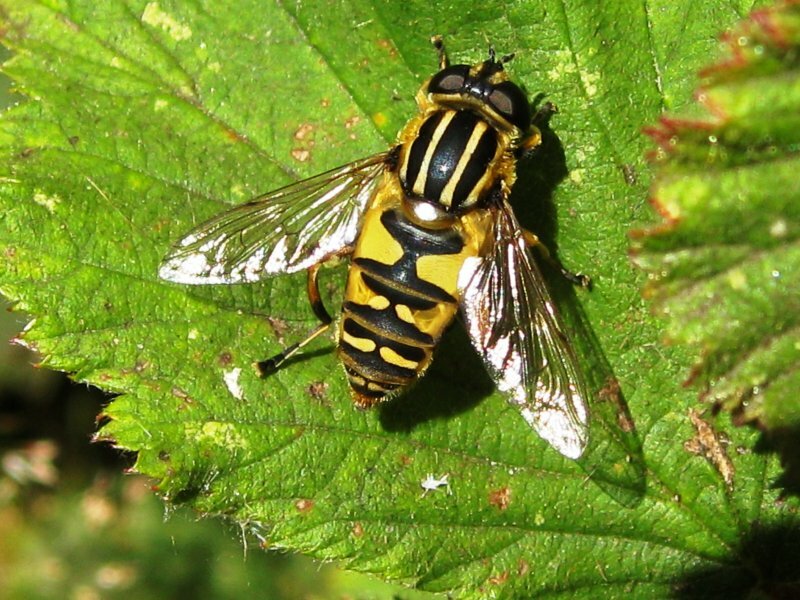 Although it has a striking wasp-like appearance, it is completely harmless. Colour Elytra (wing casing) rich orange-red. 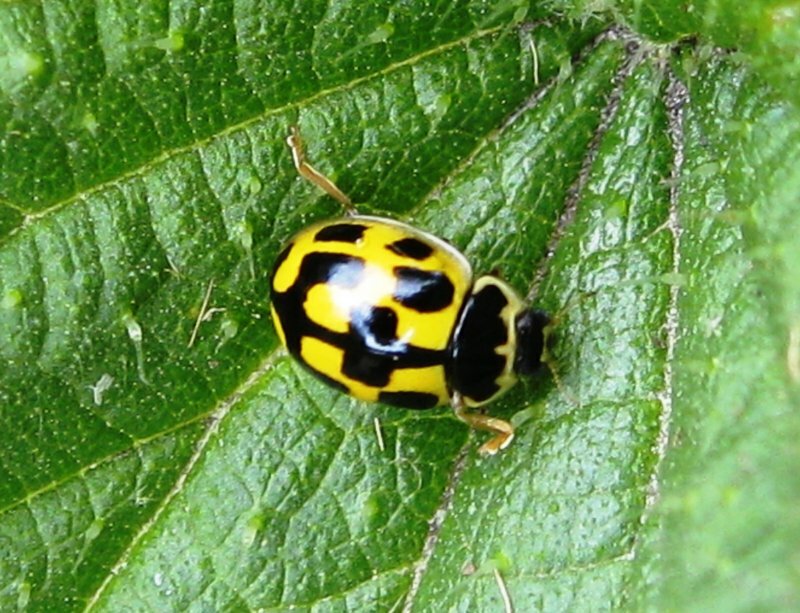 Black spots usually ringed in pale orange (as picture) - producing an eyed appearance. Habitat Usually found near conifers! Seen in North Scrubs. Winter Hibernates in soil or moss under pines! 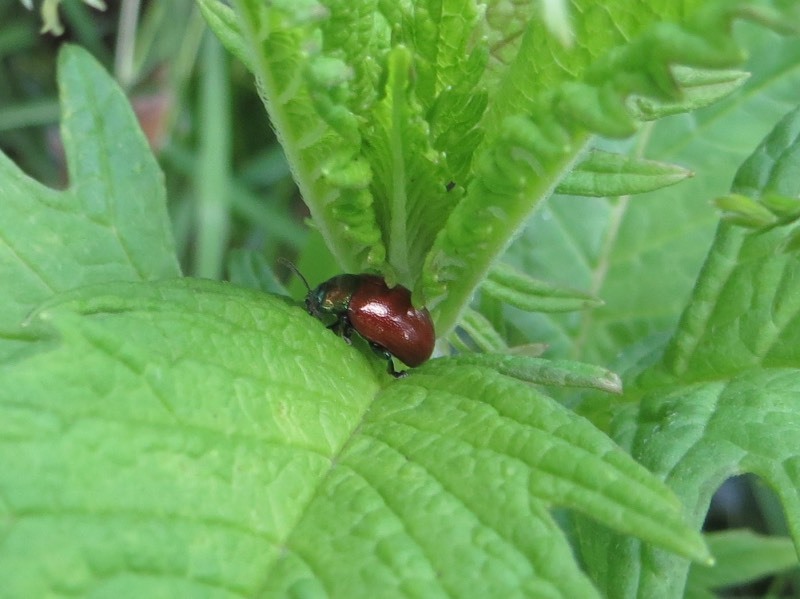 in 2004 Larger than native ladybirds, voracious & invasive. 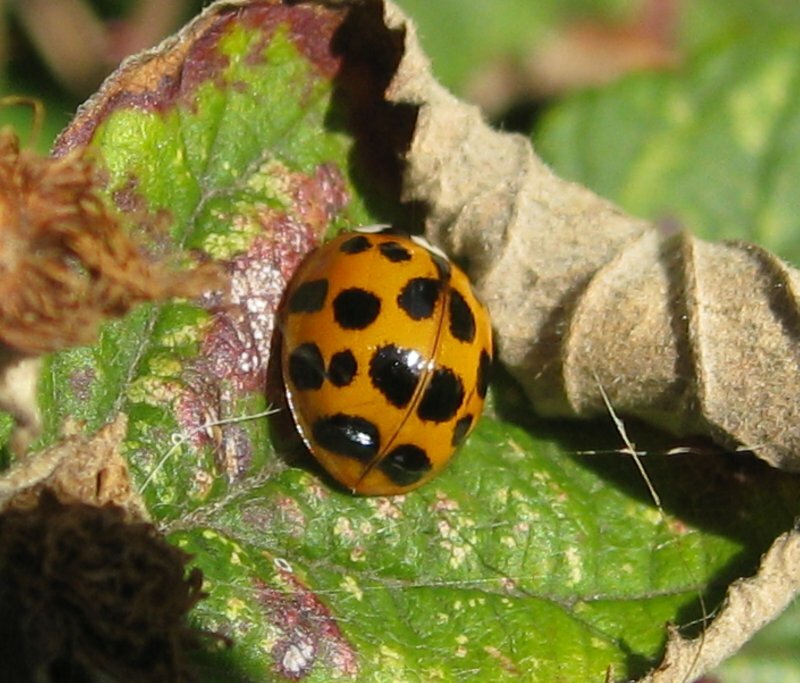 Unlike native ladybirds, they breed prolifically during the Spring to Autumn months. 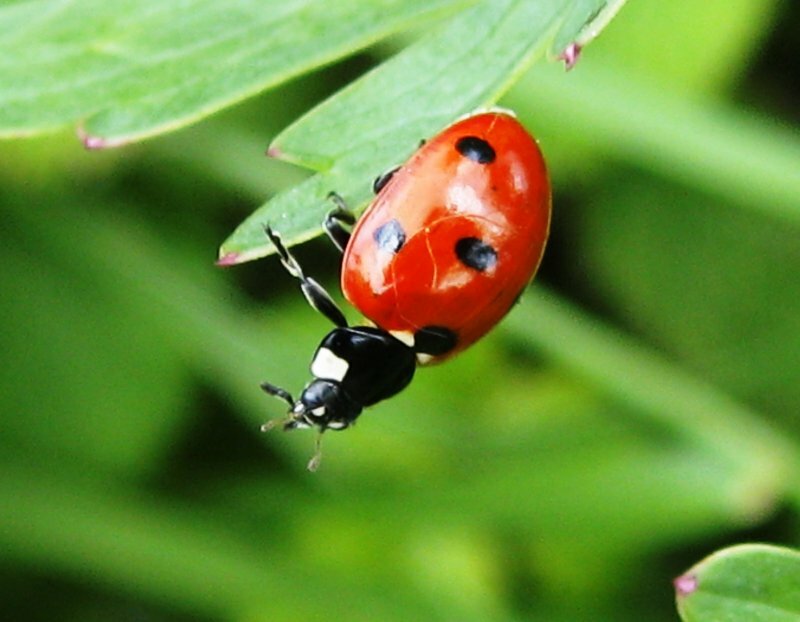 Food Like native ladybirds, Harlequins also eat aphids, but they also eat eggs & larvae of other insects, including those of ladybirds! 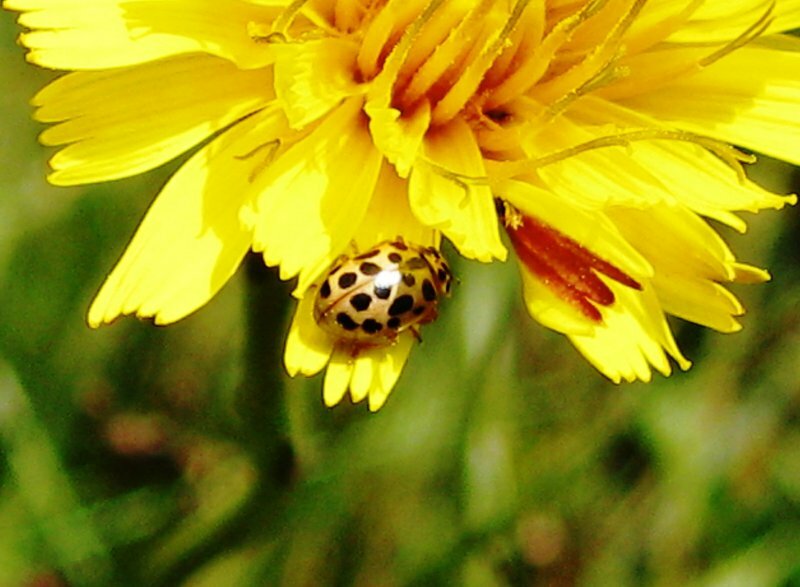 The decline of 2-spot ladybirds, in particular, is thought to have been caused by this predation. Over-winters Adults congregate in Autumn, sometimes forming very large groups, and partially hibernate in cracks in stone, wood, or buildings etc. 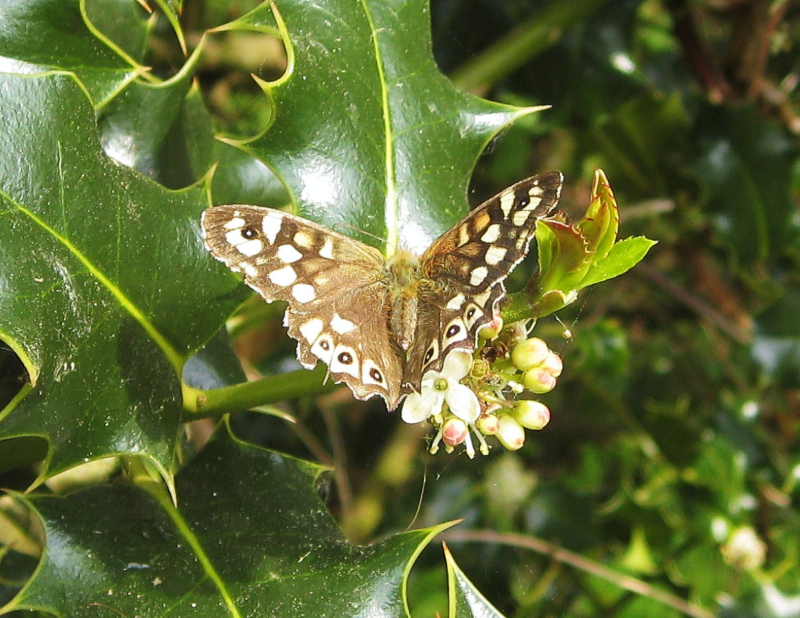 Adults feed on Mainly Gorse, but several other plants. Winter Hibernates - re-emerging as fully grown adult. Eggs are laid in May, in 2 rows of 7, and hatch within 4 weeks. 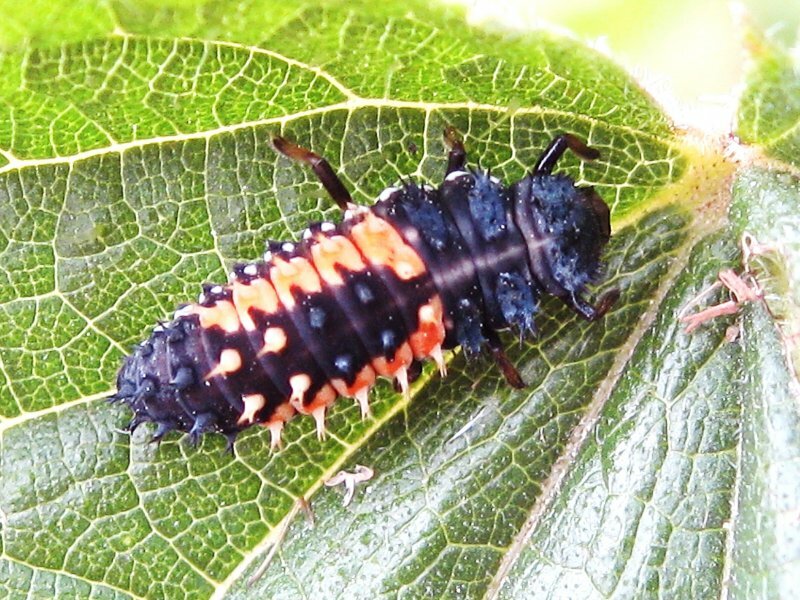 The tiny nymphs are orange/red and they consume the egg cases upon hatching. 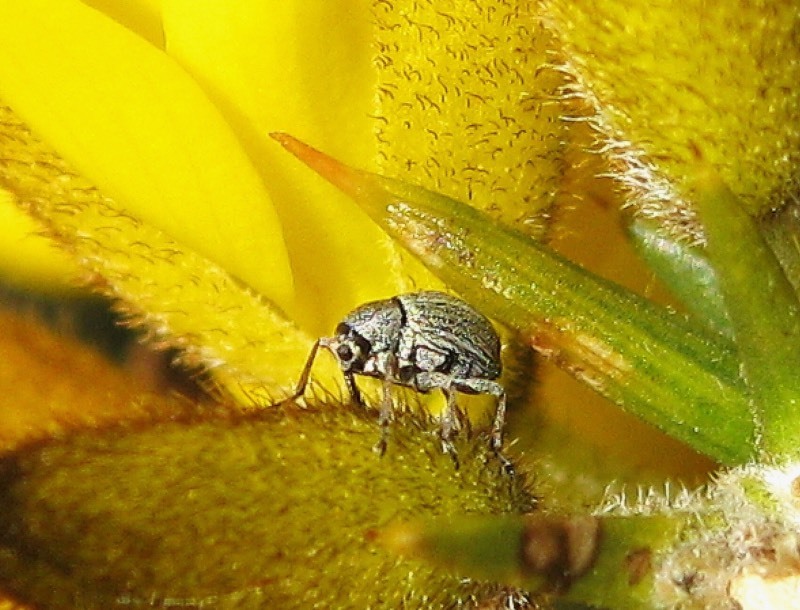 This remains in the bug’s gut for life, and help with digestion of food. Where seen on marsh North Scrubs and other shrubby places. Adults feed on A variety of trees, shrubs and plants. Lavae A variety of shrubs and plants. Winter Hibernates. Turns reddish before hibernation,. but re-emerges bright green in spring. 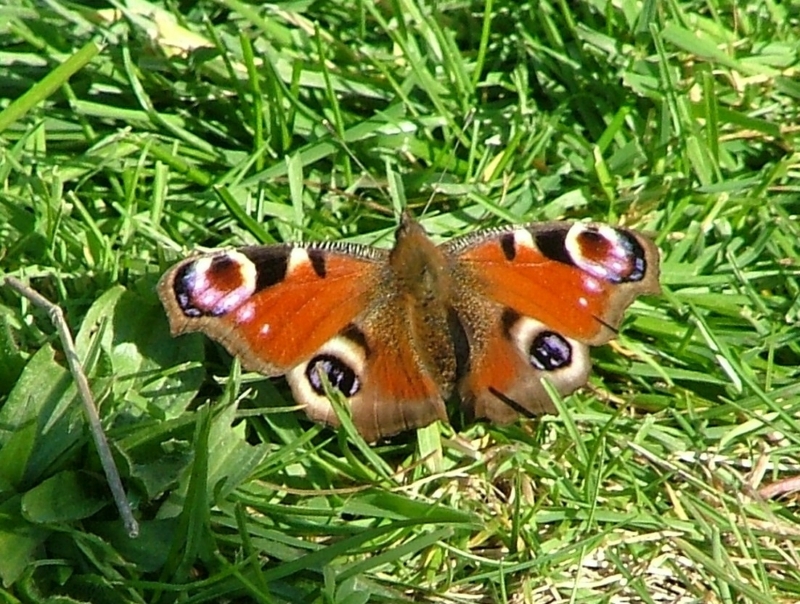 Adults over-winter, lay eggs in Spring, and larvae fully adult by August. This species over-winters as eggs, and reach adult-hood by July/August. Its name derives from resembling a tortoise when it withdraws all appendages, and clamps down on a leaf to conceal itself. Eggs are laid on the underside of leaves in batches of up to 1000 every 6 weeks, with 7 week rests in between. Larvae develop into adults in 6 weeks. During their development they conceal themselves by covering their bodies in moulted skins and their own droppings! The snout is half the length of its body. 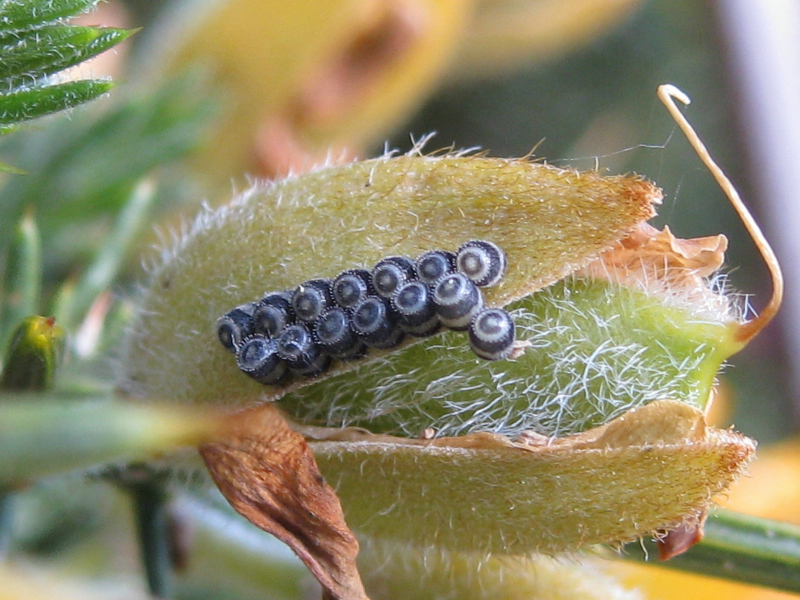 Eggs are laid in late Spring within the gorse seed pod.Larvae feed on the seeds for 6-8 weeks, then pupate for about 1 month. The new adults can only emerge when the seed pod bursts open. If the pod does not burst, then they will die. 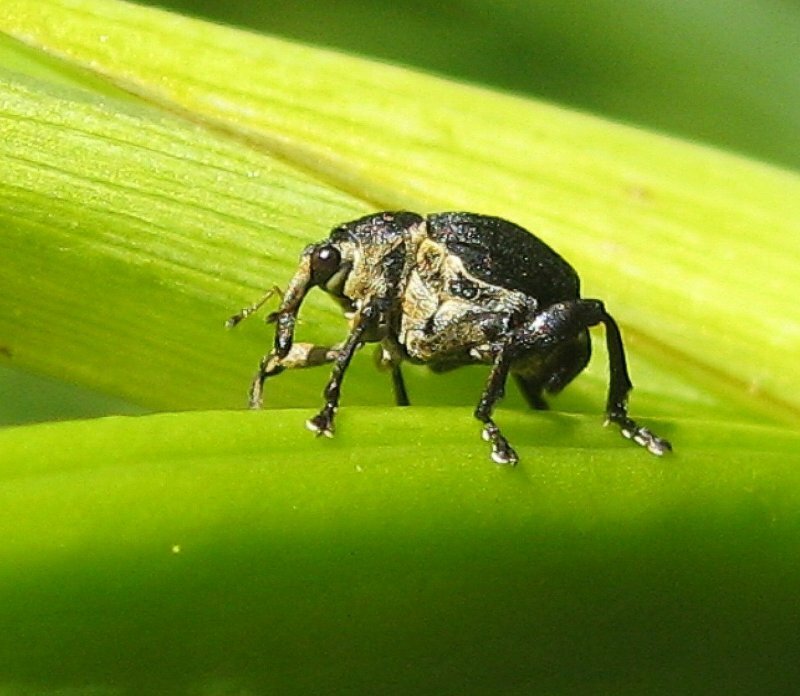 These weevils were exported to New Zealand during 1931 and 1946, also to Canada, as a means of controlling gorse. The female used her long snout to drill into the seed pod, laying her eggs deep inside. This particular species is also called Mononychus pseudacorus (after the iris) but a darker variety, as pictured, is named as above. 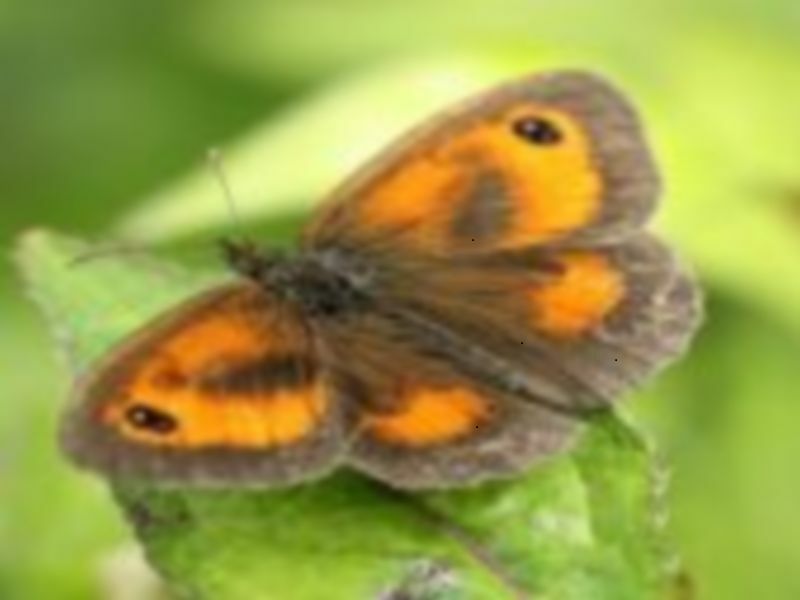 Contrary to most butterfly species, the female is brighter than the male, especially the black ‘eye-spot’. 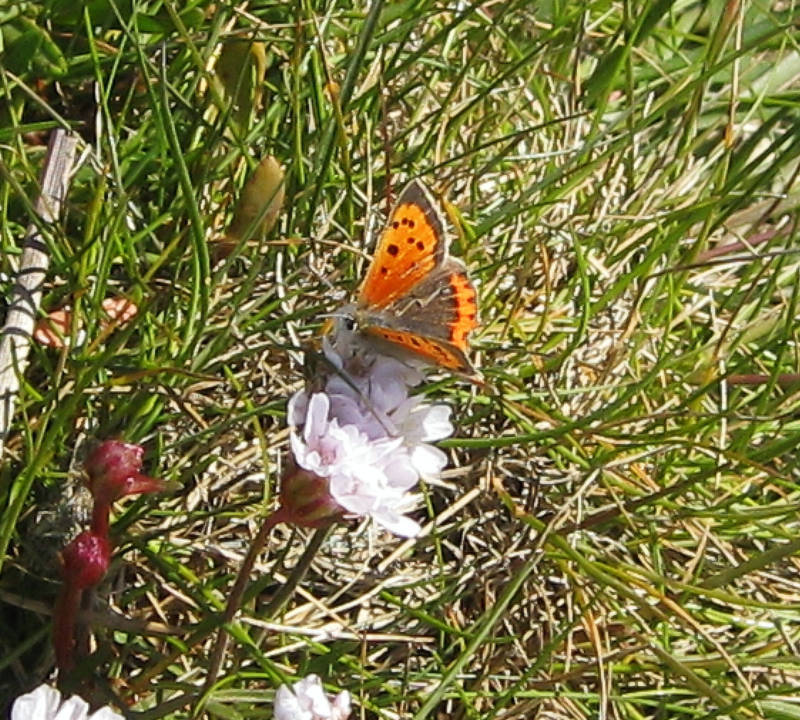 The male is predominantly brown, with very little orange. 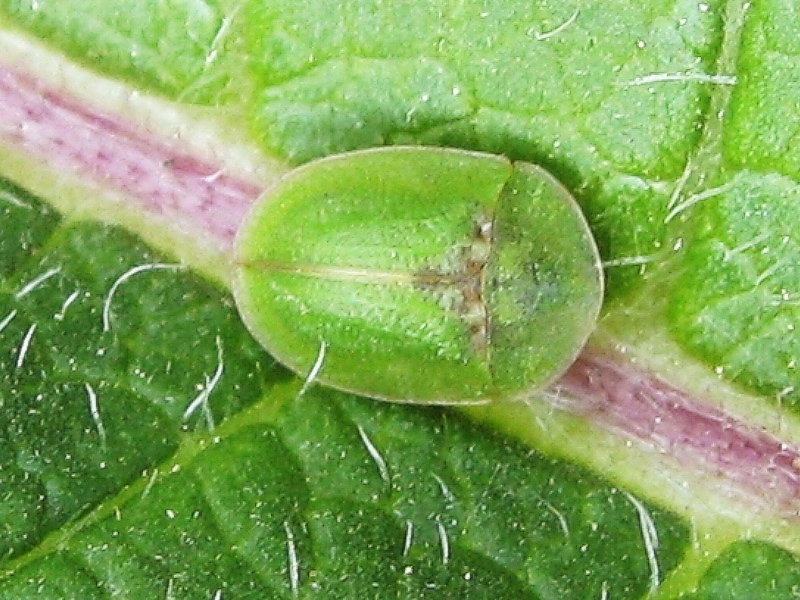 1st generation produced from eggs laid by the over-wintering butterflies. The butterflies from the 1 st generation are much lighter in colour. 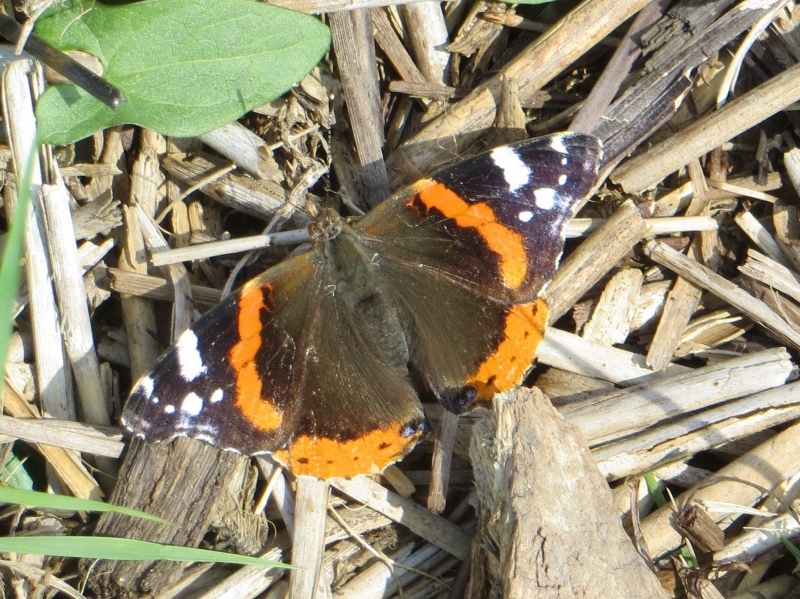 This butterfly is easily recognisable by its ‘jagged’ wing edges. 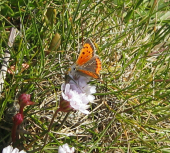 A very small butterfly, often seen feeding on Thrift or Fleabane. Adults can live for up to a year. Adults feed on In the wild - nectar of teasel, scabious, clover, bramble and ivy. 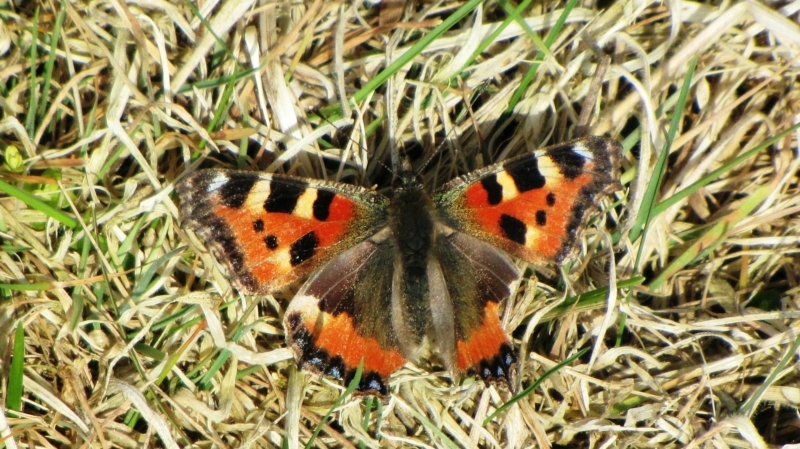 Overwinters as Butterfly in Southern England. 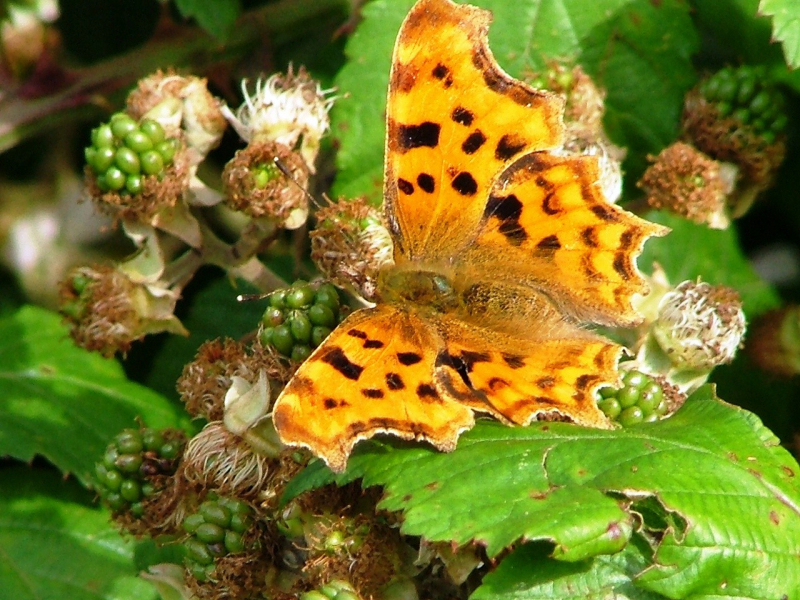 This butterfly is a migrant from Central Europe and a resident in Southern England. 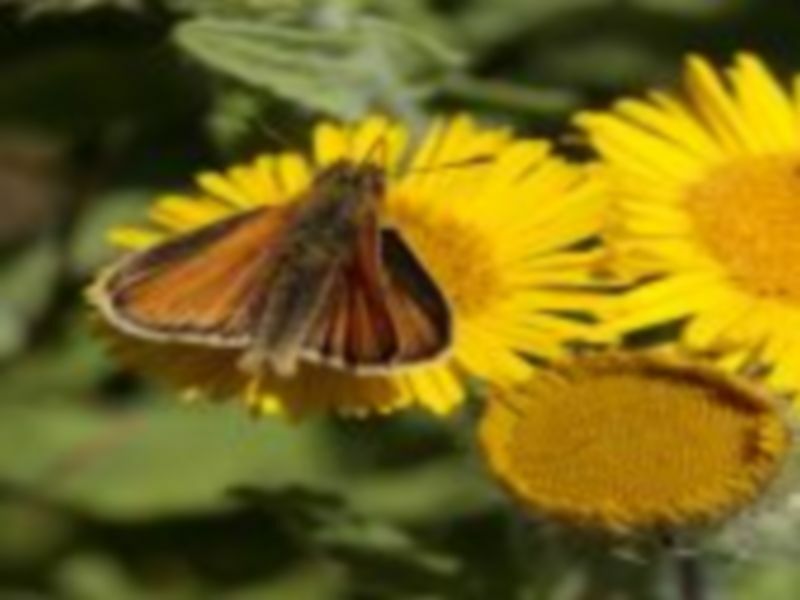 This is a Small Skipper, taken in Ashtree meadow. 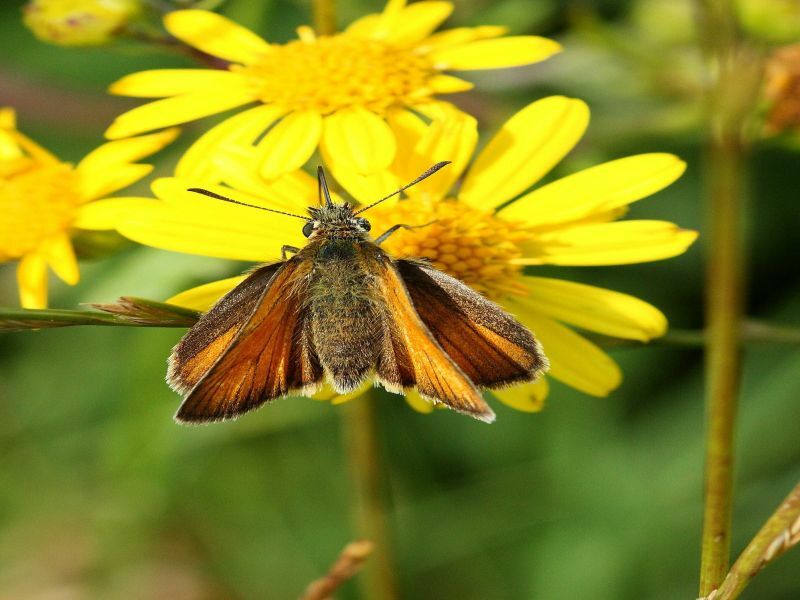 This is an Essex Skipper - an unusual species on the Marsh. This butterfly seems to have declined over recent years. Where on marsh North Scrubs. 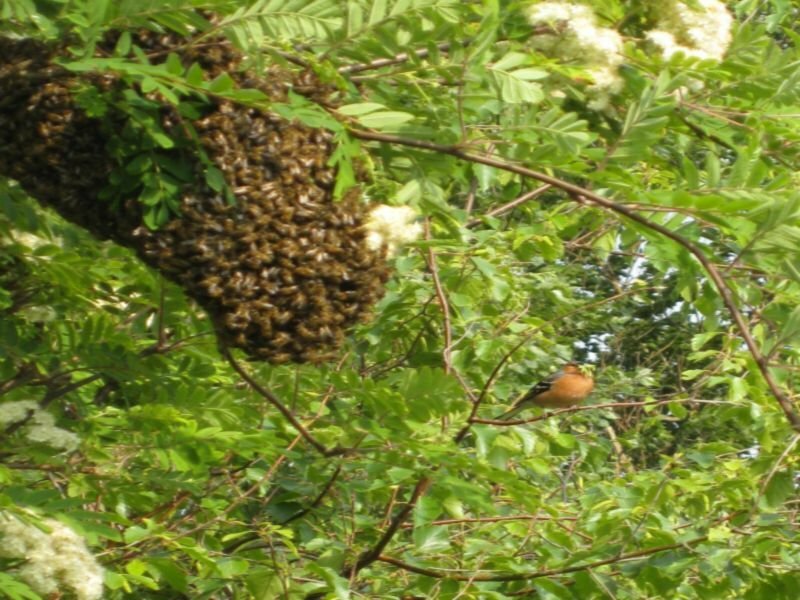 Swarms on lower tree branches, and vegetation. 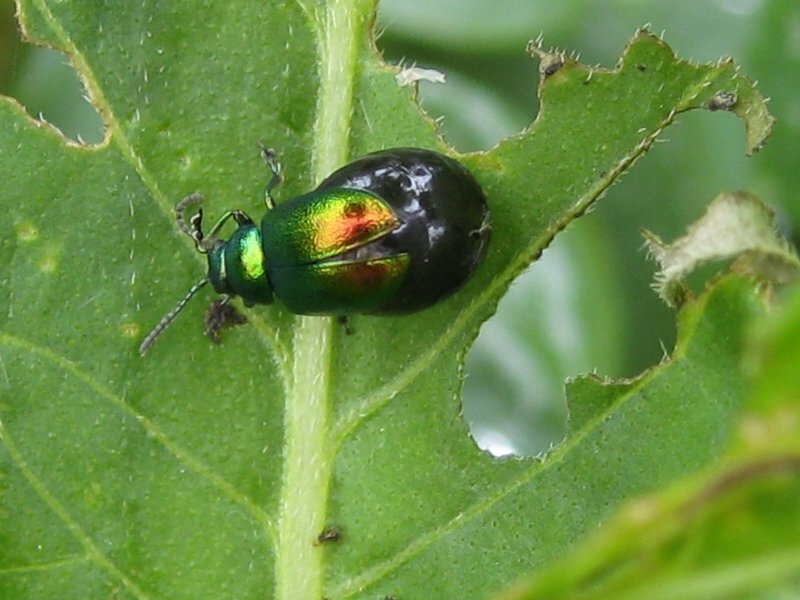 Larvae Build a protective case from debris (rather like a hermit crab), and feed on oak leaf litter. 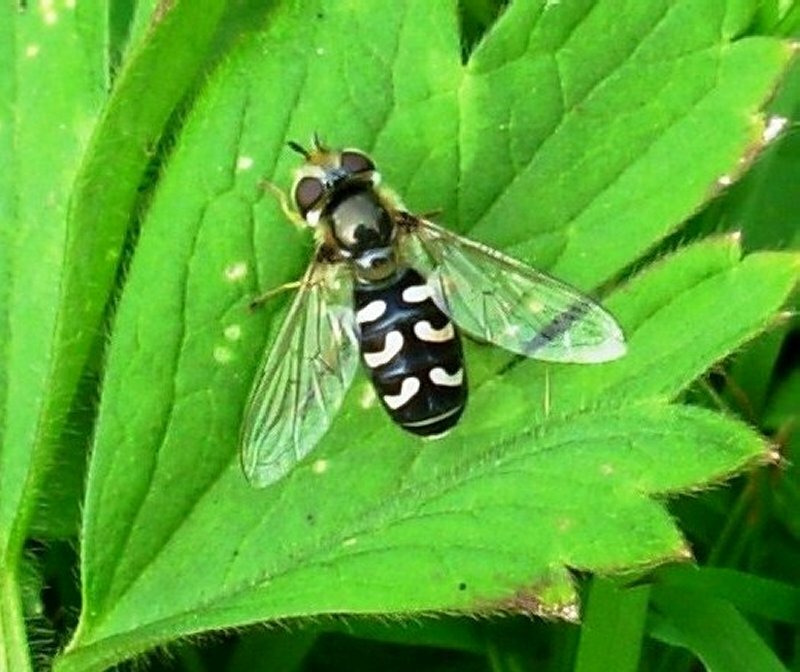 Metallic coloured wings. 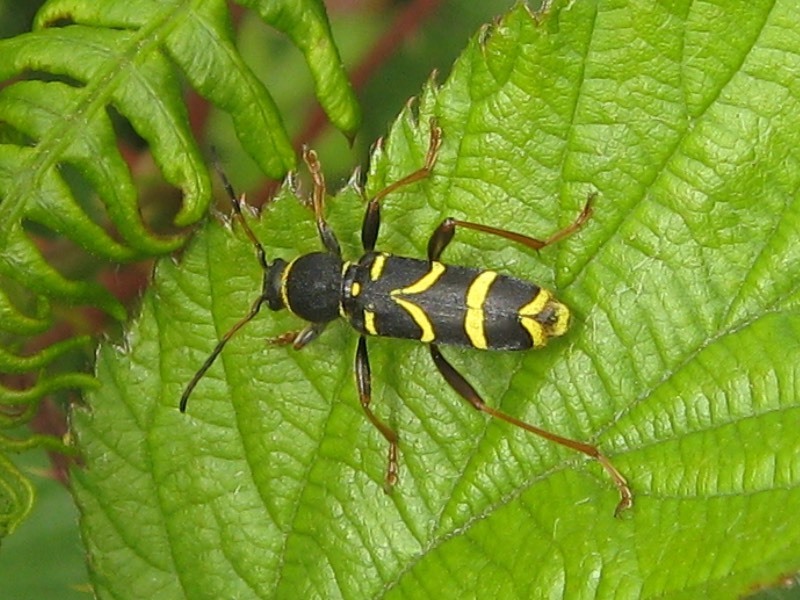 Males antenna very long – sometimes 3 times body length - females not so long. 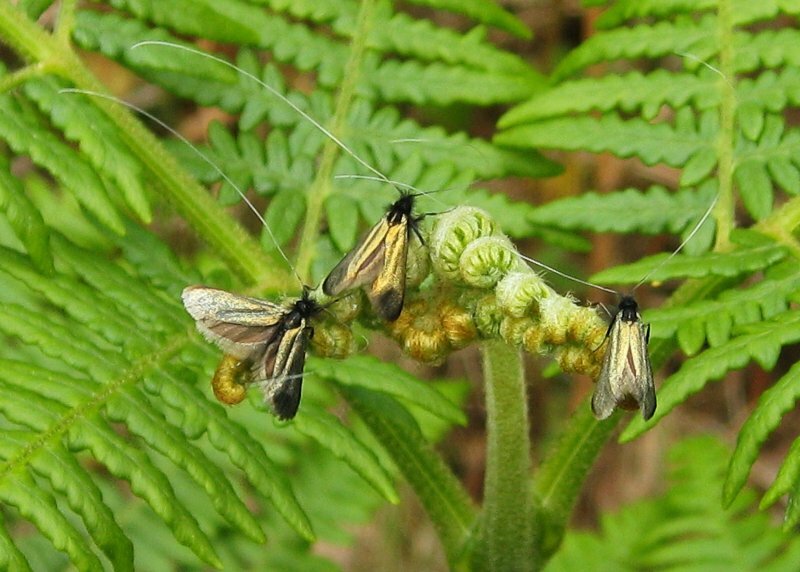 There is little information of individual species of Longhorn moths, but the above is the best we have to date. Where on marsh Damp grassland, North Scrubs, on mint, dead-nettle, and marjoram. 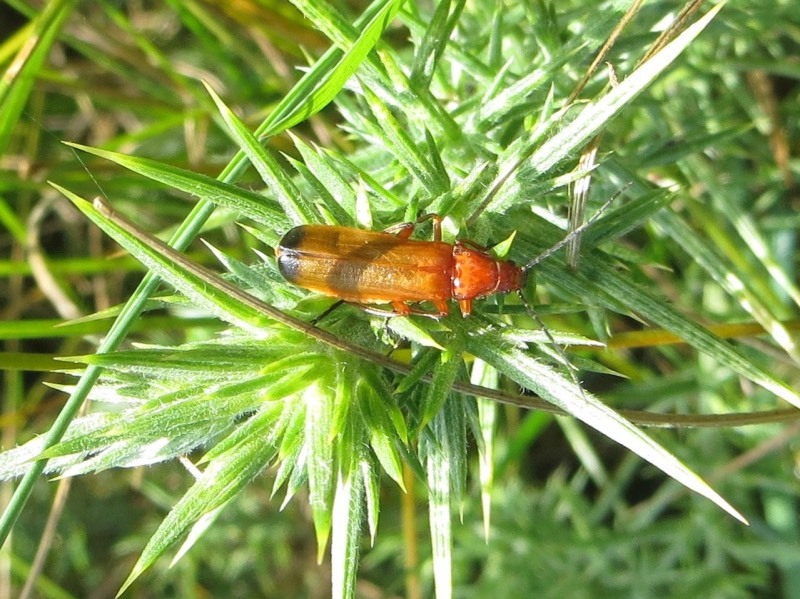 Where on marsh Grassland, North Scrubs and other shrub habitat. 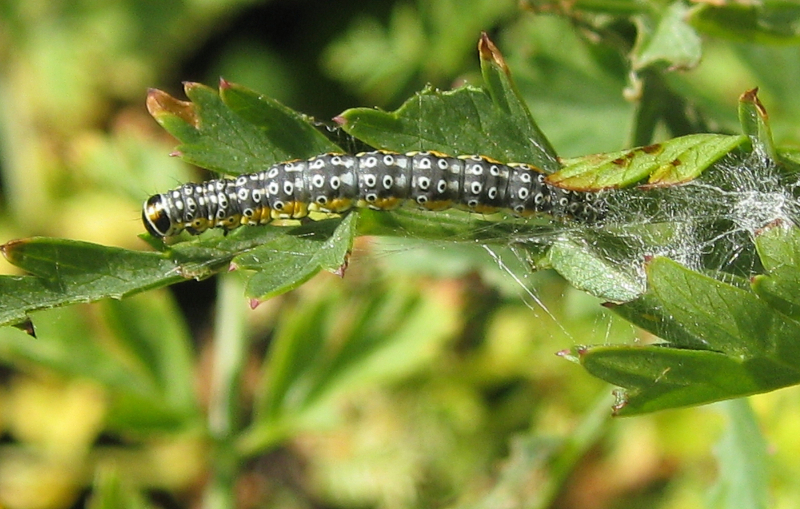 Larvae feed on Feed a variety of low plants – bedstraws, clovers, common nettle. Migrant from Europe, parts of Africa, and Asia. Can be numerous some years. The Cinnabar Moth which is black and red is a night flyer, though it is sometimes seen during the day. 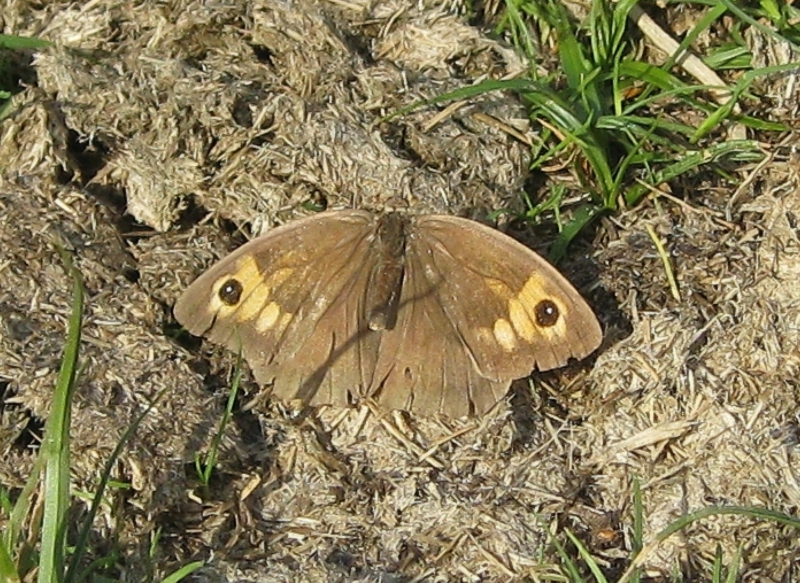 The moth is plain brown with white spots on the forewing. 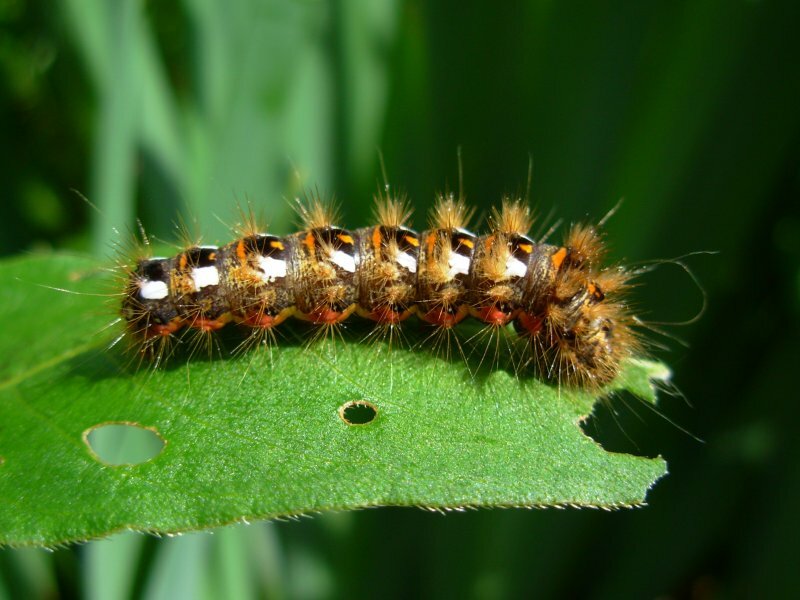 It gets its name from the caterpillar which likes to drink rain or dew droplets from the grass stems on which it feeds. In flight July – August, 2nd brood August and Sept. 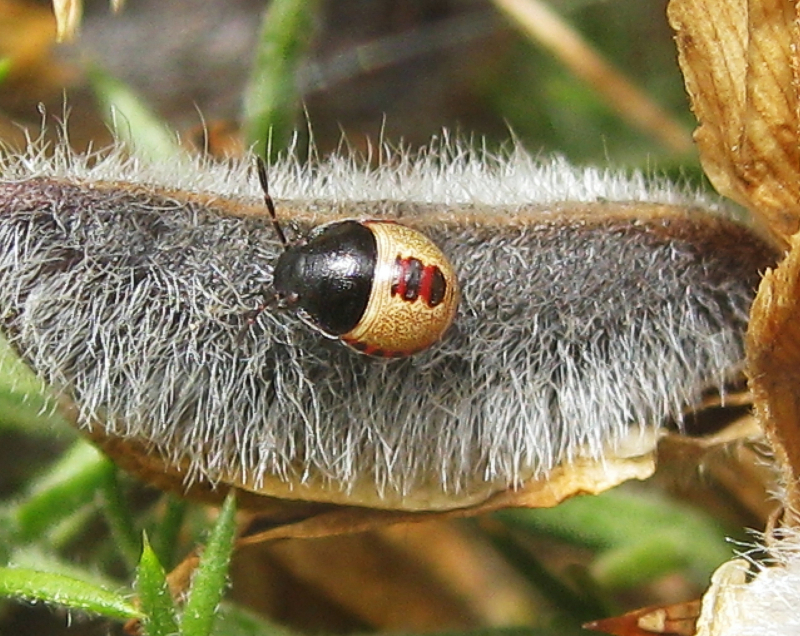 The hairs of this caterpillar are well known for causing irritation, if handled. The female moth is pure white, fluffy around the head, with brown hairy tail. 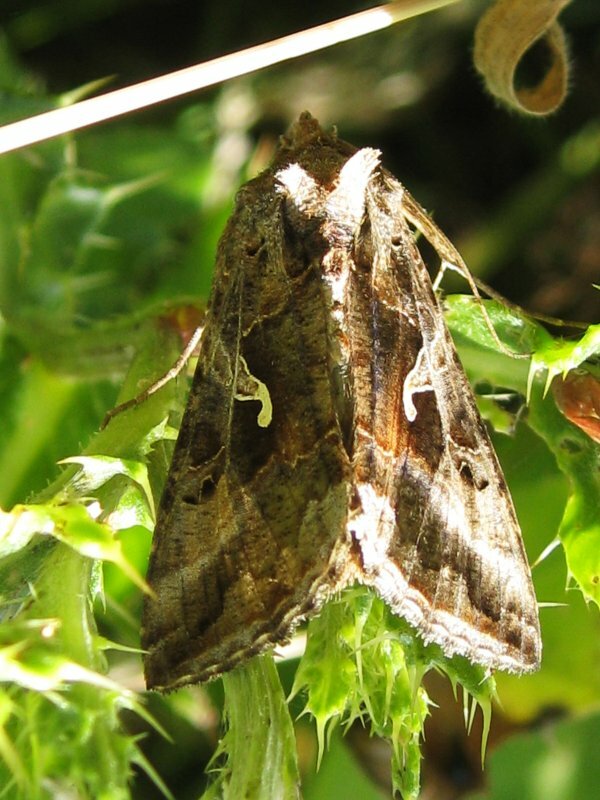 The moth is rather ‘plain’ with brownish upper wings, and lighter under-wings. Larvae bore through stem wall of plant, and pupate in a cocoon within the hollow interior. All grasshoppers and crickets over-winter in egg form. 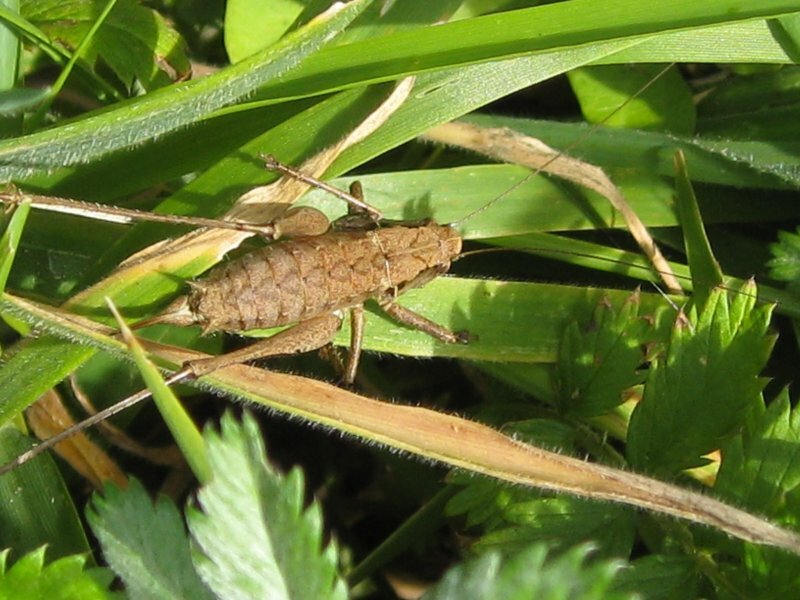 Depending on the species, nymphs and adults can be seen between June/July – October/November. Nymphs have several moults – known as instars – before reaching adulthood. This can make identification difficult. 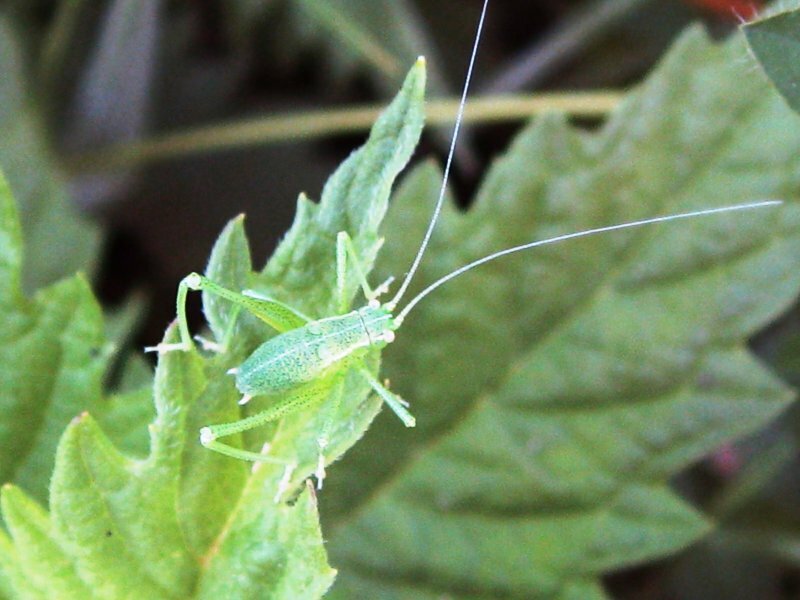 Crickets can be distinguished from grasshoppers by their long antenna. Measurements given are from front of head to tip of abdomen. Likes dense vegetation, especially nettles. Virtually wingless - crawls through the undergrowth. 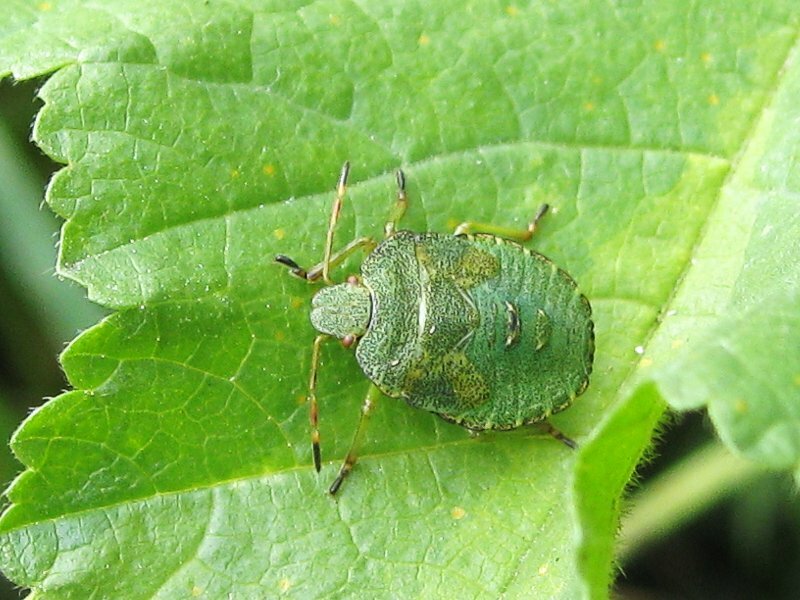 Food – vegetation and small insects. Likes rough vegetation – sometimes seen in gardens. Females are wingless. 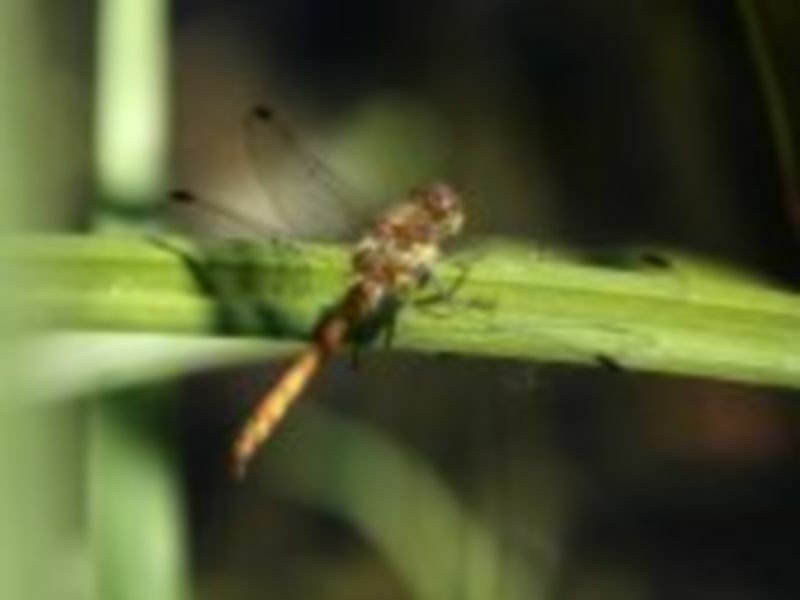 Males have very short wing parts. They crawl through the undergrowth, and are very shy. 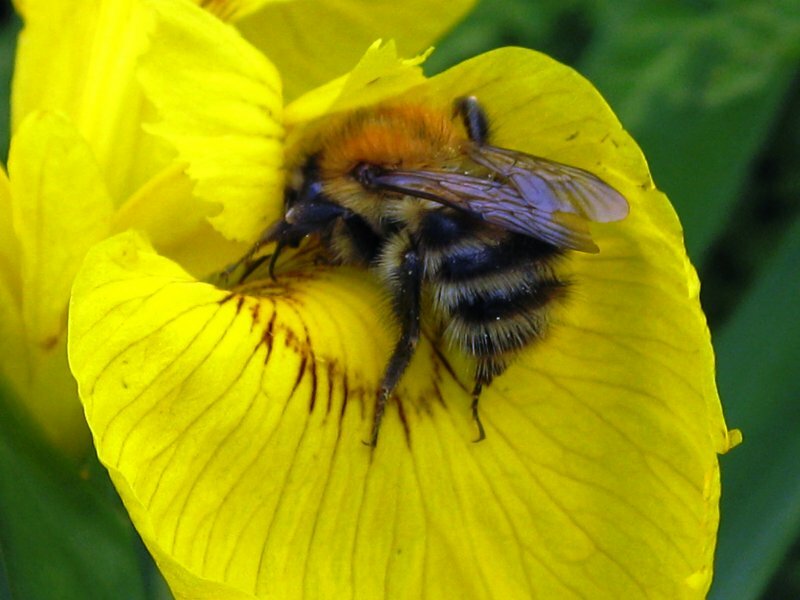 Food – vegetation, small insects and flowers (pollen & nectar). 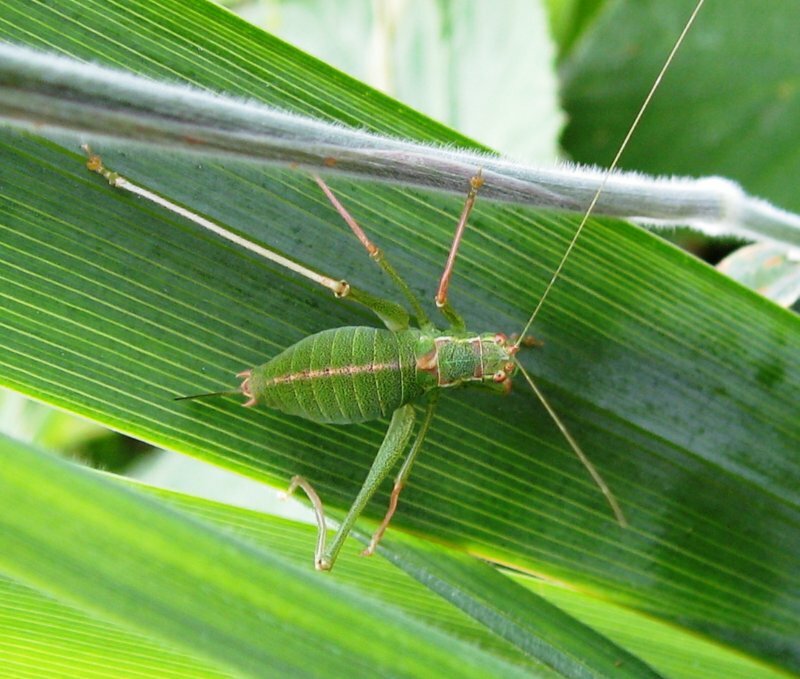 The largest of British bush-crickets. 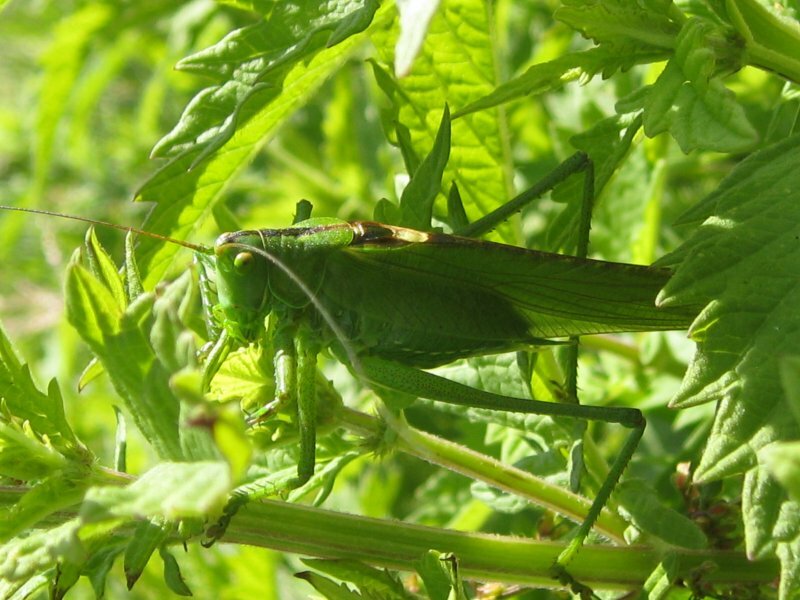 Food – vegetation, small insects, caterpillars and also grasshoppers. 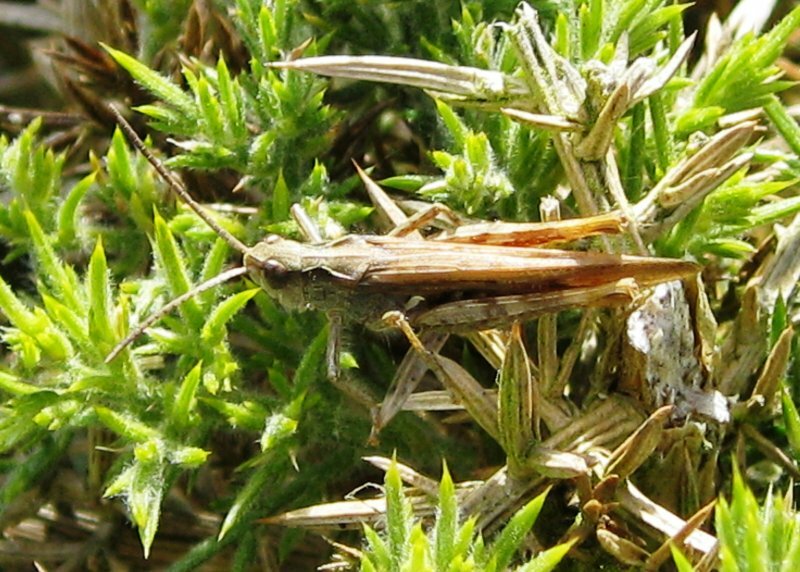 Probably most common of the grasshoppers. Food – grass and other vegetation. 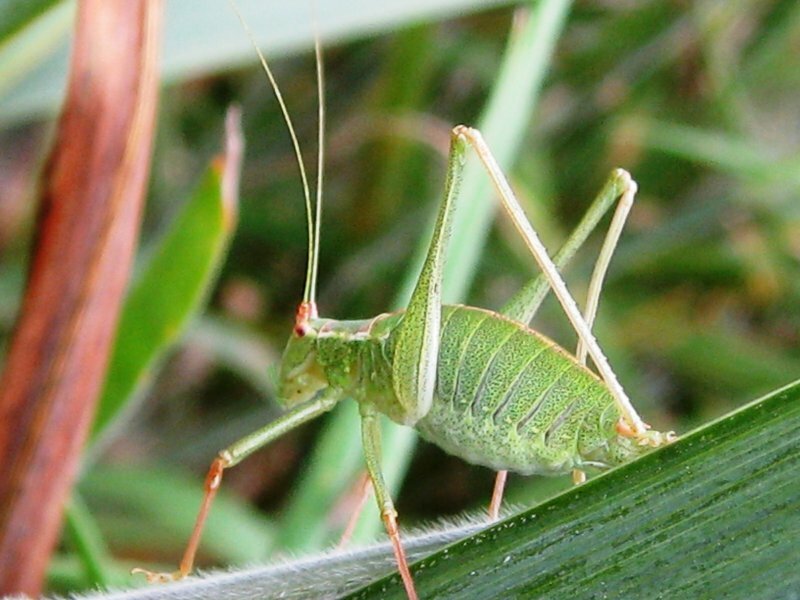 The most common of grasshoppers. Both sexes have short wings. 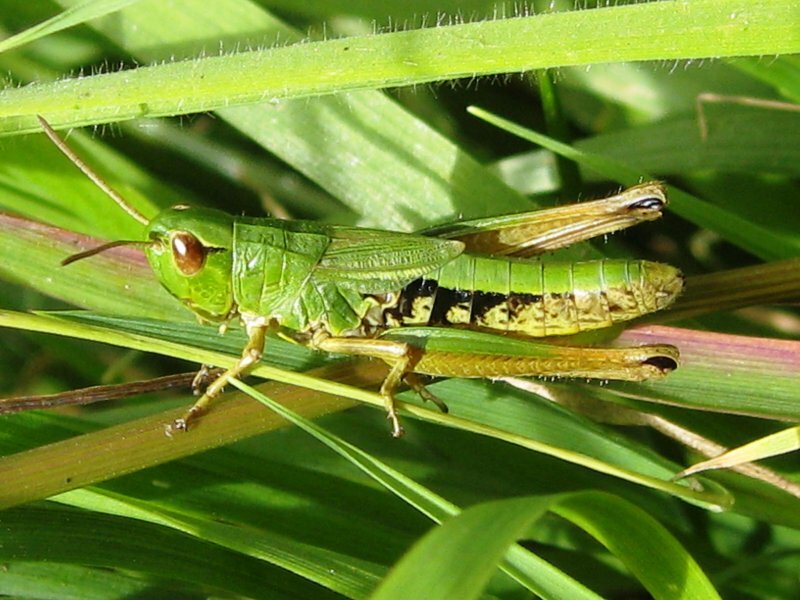 Most grasshoppers shed their skin 4 times before reaching adulthood in late May or June. Their eggs are laid batches of 15 or so in pods in soft soil, and hatch in early spring. 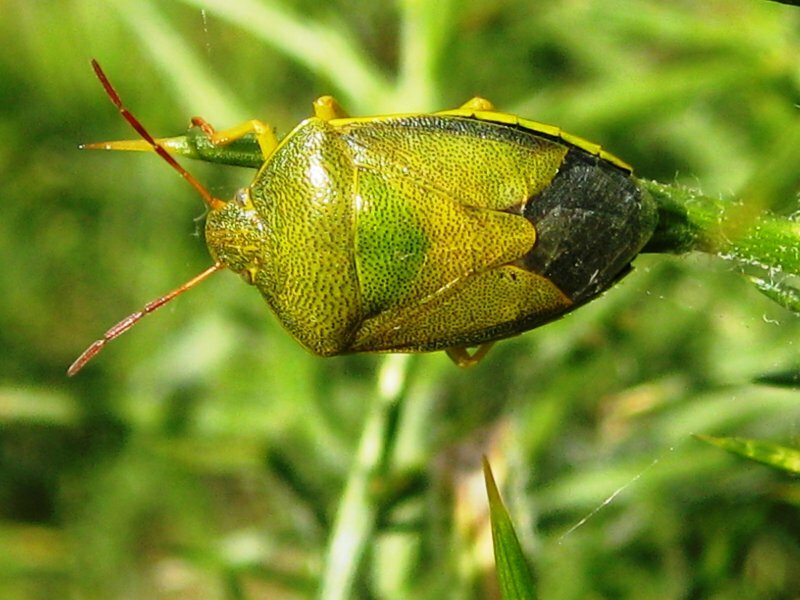 It feeds on plants, but mainly thin grasses. Larvae are aquatic, living in a variety of water types – calm, slow-flowing, fresh water and even brackish. 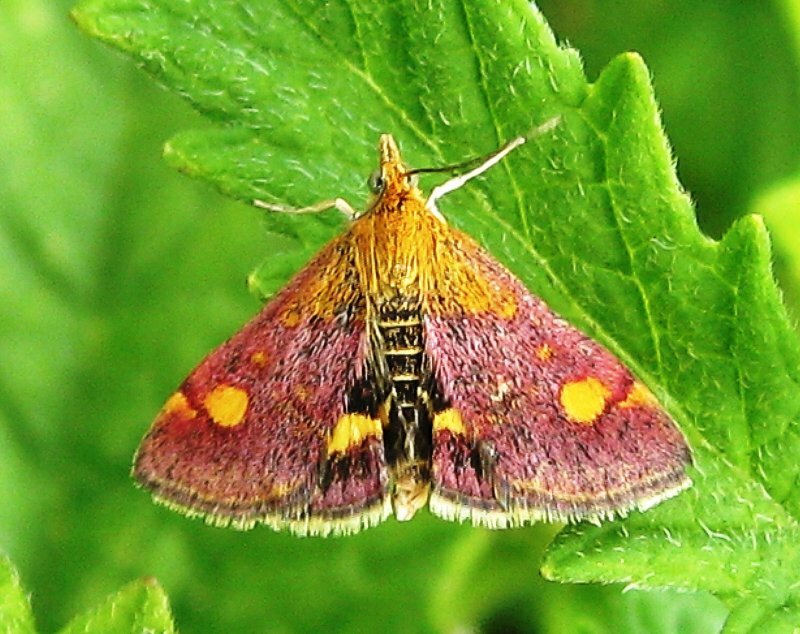 Although migratory (as its name suggests), it now breeds in Britain. Some years, resident numbers are increased by swarms of migrants. Larvae are aquatic, living in still fresh water ponds or lakes for 3-4 years. 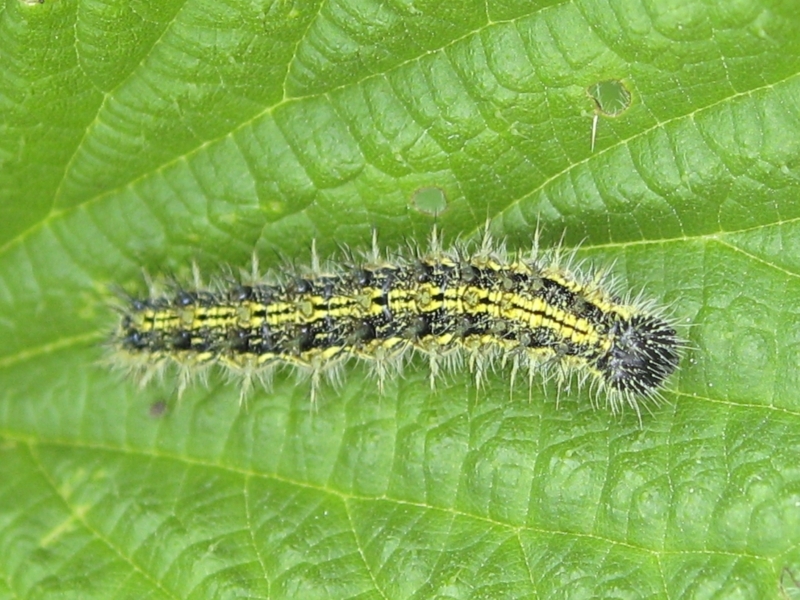 Both adults and larvae are carnivorous. Adults are day-flying. 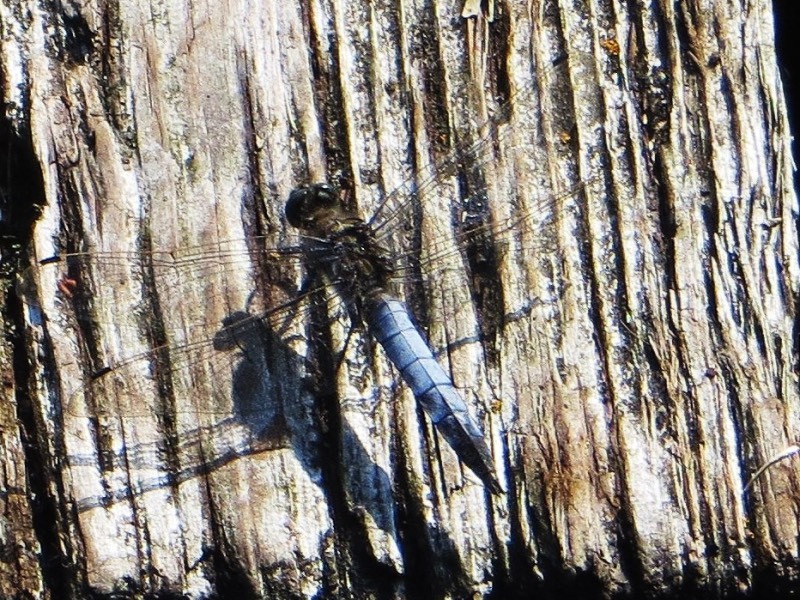 Most dragonflies only fly in calm, sunny weather, but this one also flies when it is dull or damp. They have their own flight-paths, when searching for insects, and can often be seen hanging from gorse or other shrubs when at rest. 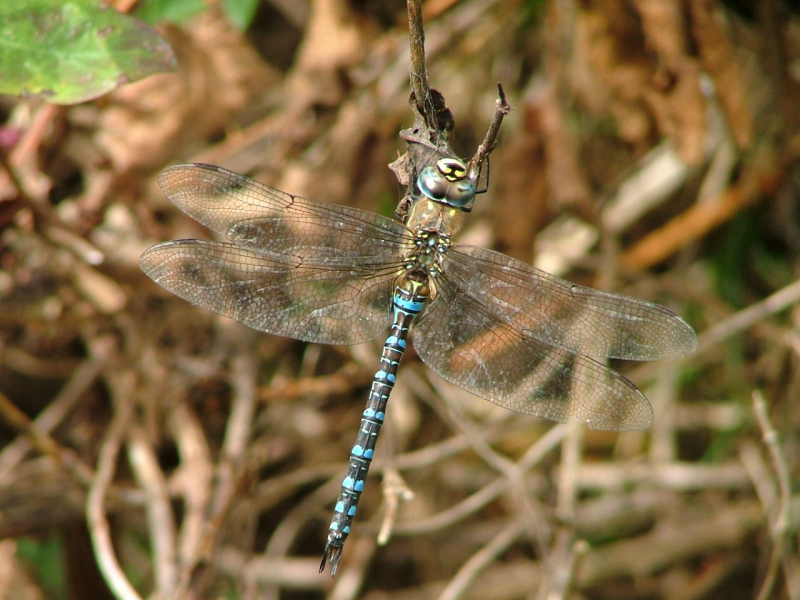 Found at any open water with bare patches of ground where patrolling males often bask in the sun. They fly swiftly and low, skimming the water surface. 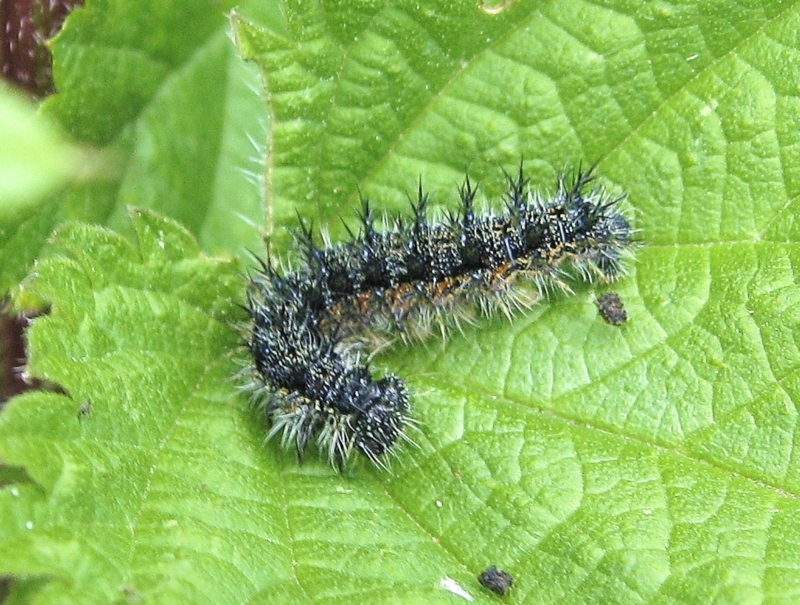 The larvae take 2–3 years to mature. 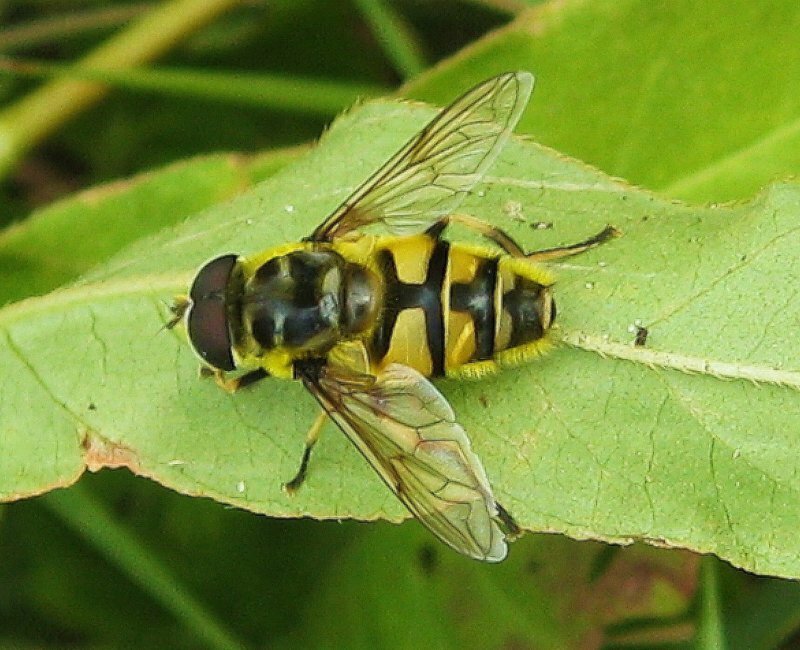 Where seen on marsh Marshy areas, often hovers over pools; and North Scrubs. Larvae Eggs are laid in muddy water and hatch into what are termed as rat-tailed maggots. Also known as the ‘Sun-fly’ as it likes to bask in the sun. Where seen on marsh North Scrubs and other shrub habitat. Larvae Eggs are laid in water-filled tree holes, and hatch into what are termed as rat-tailed maggots, which have breathing siphons at their rear end. Ichneumon flies are parasitic flies. Eggs are laid in grubs – mainly those of butterflies and moths, and this particular species actually lays its eggs in pupae too. 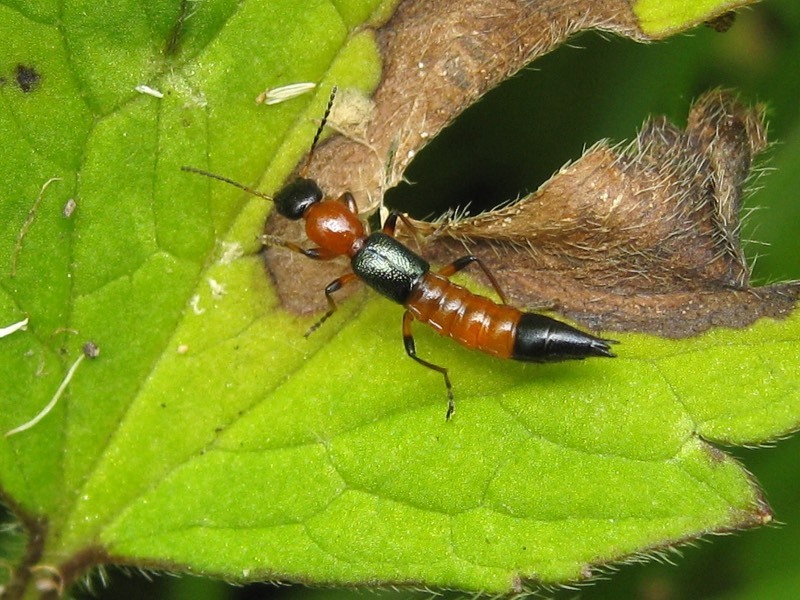 The ichneumon larvae consume the food that the stricken grub eats, and leave the critical internal organs until it is ready to pupate. 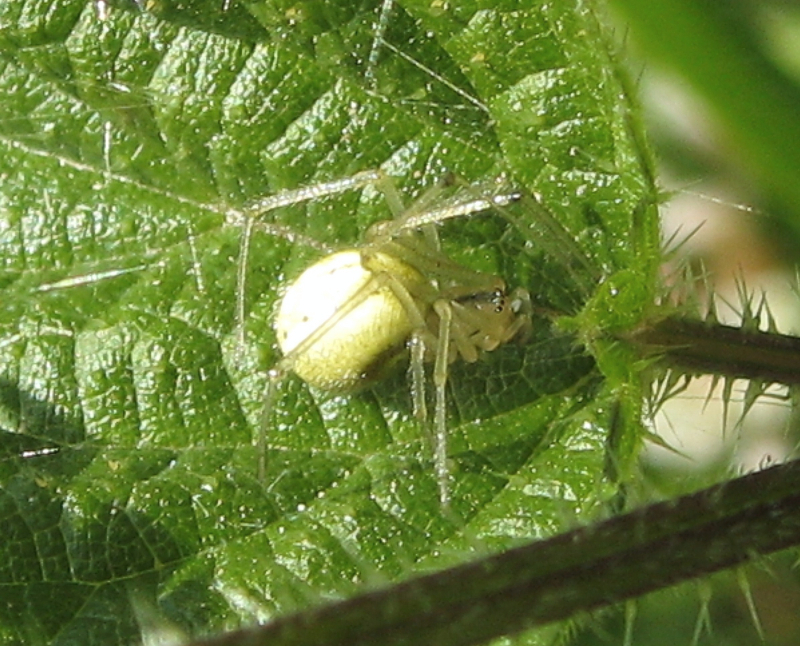 Colouring The female is white, yellow or green, some with red lines. It can change colour to suit the flower it is sitting on. 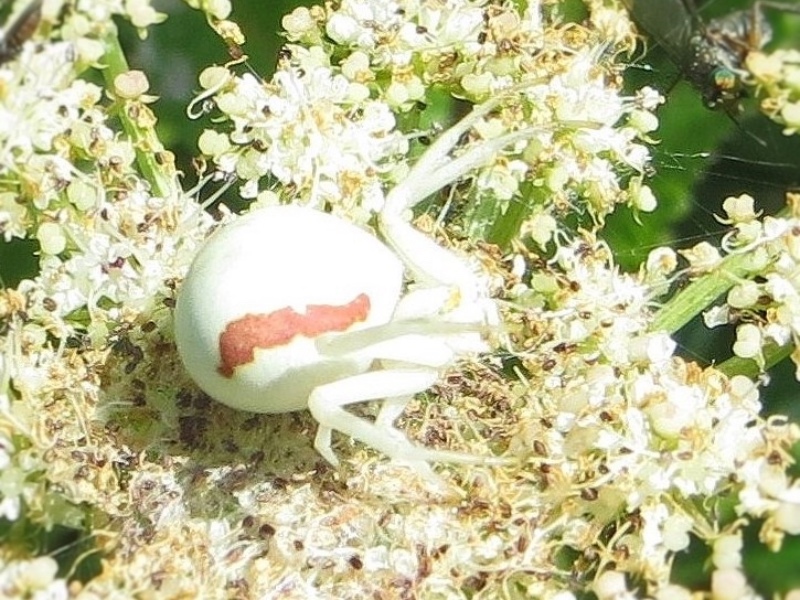 A member of the Thomisidae family, the Crab spider is common in Southern England and Wales. It resembles a crab and is able to scuttle sideways or backwards. It is not a web-builder, but sits on a flower with its two front legs stretched out to the side waiting to grab passing insects such as flies, grasshoppers, butterflies, moths and bees. 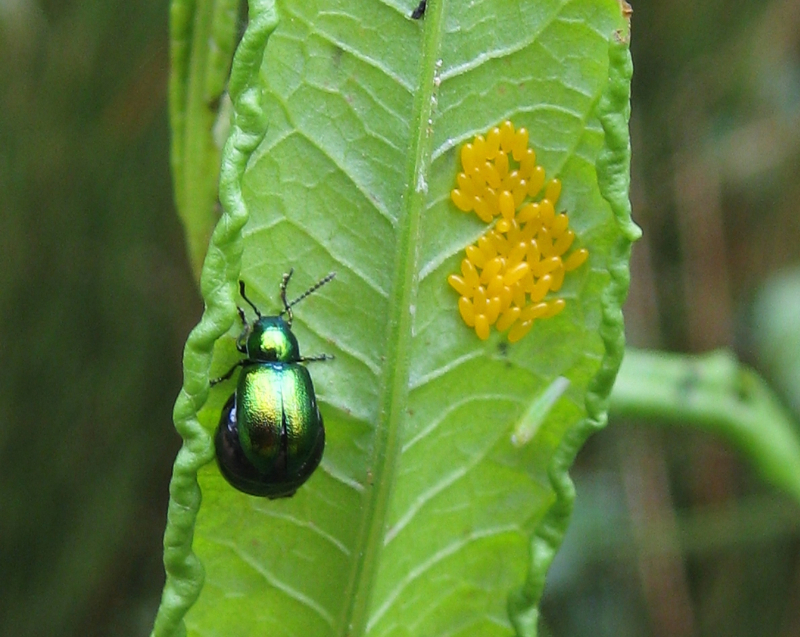 The female lays her eggs on a leaf, spins a cocoon to protect them, then folds the leaf over. She guards them without feeding and dies three weeks later. 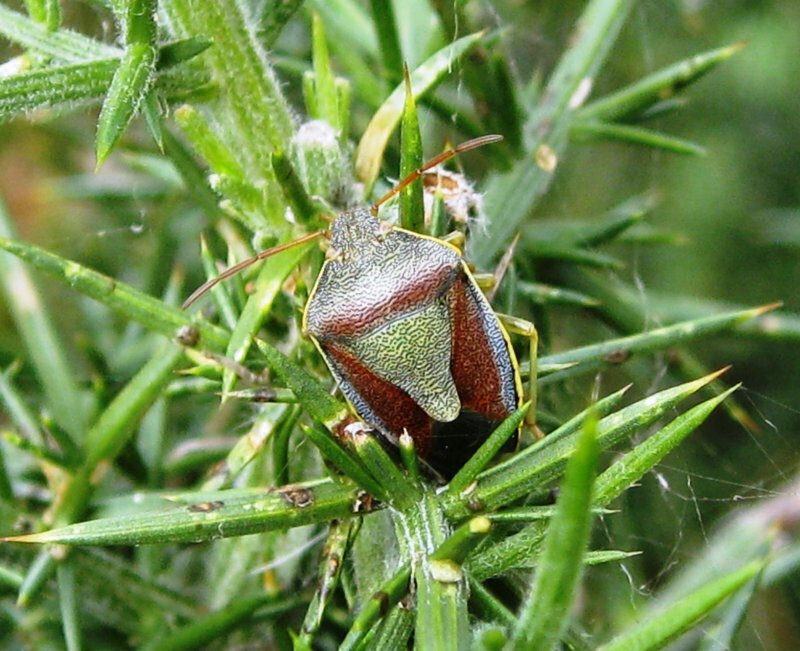 Found in North Scrubs, on gorse. 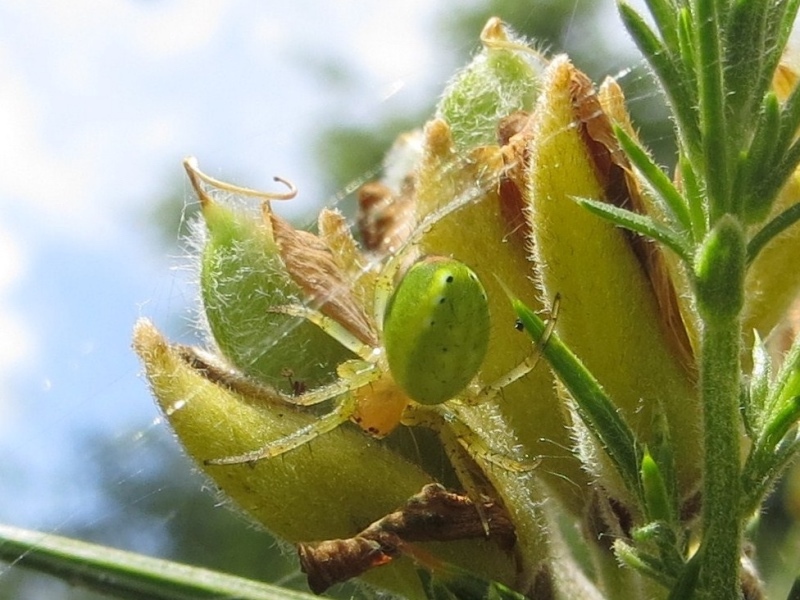 The colouring of this spider varies greatly, and the female (pictured) can also have a red stripe round the abdomen. 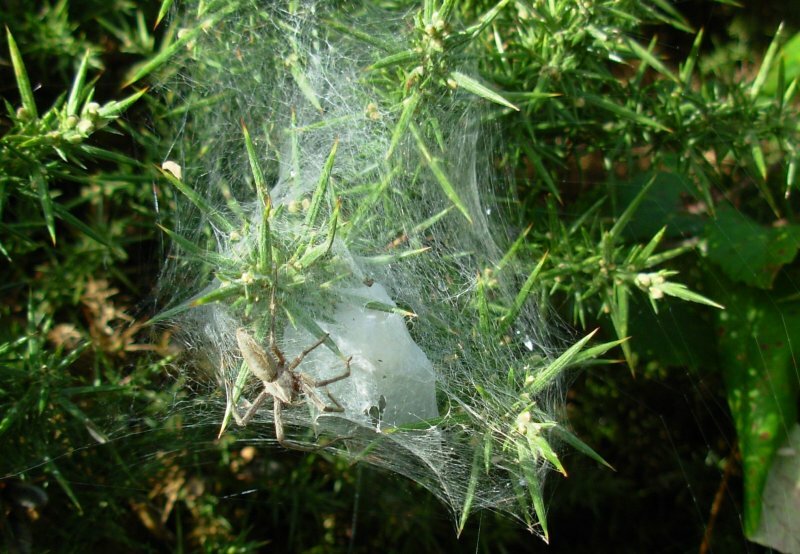 As with most spiders, they prey on insects caught in their web, which is constructed on plants. 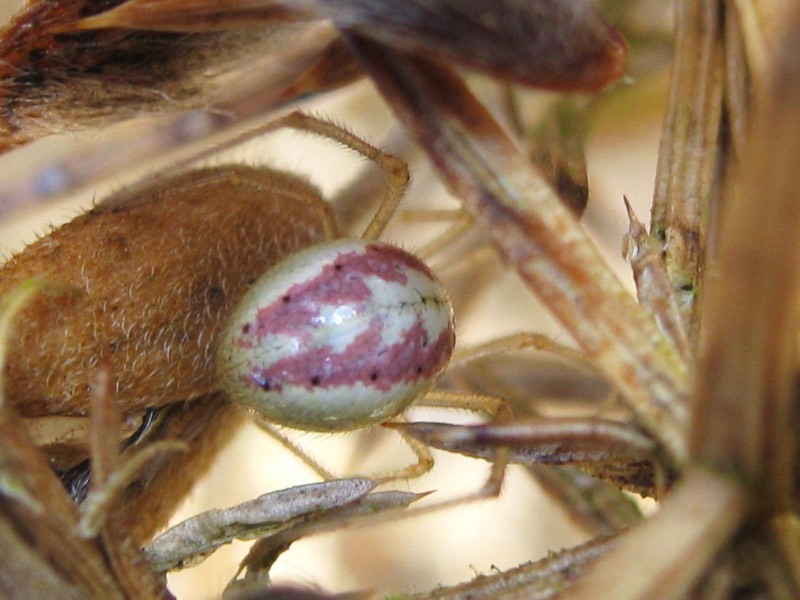 This species of spider is often referred to as the cucumber spider, because of its colouring, and adults seen in the Spring have a noticeable red mark at the tip of the abdomen (pictured). 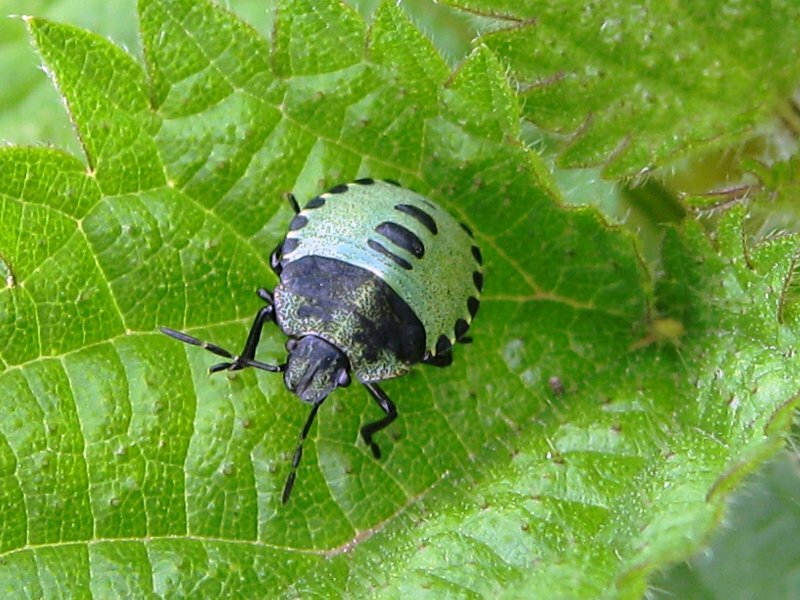 They prey on insects caught in an orb-web which in constructed between leaves and flowers. Habitat Reeds, grasses and shrubbery near water and in damp places, also on bridges and posts.Widespread in southern Britain, more patchy in the north. 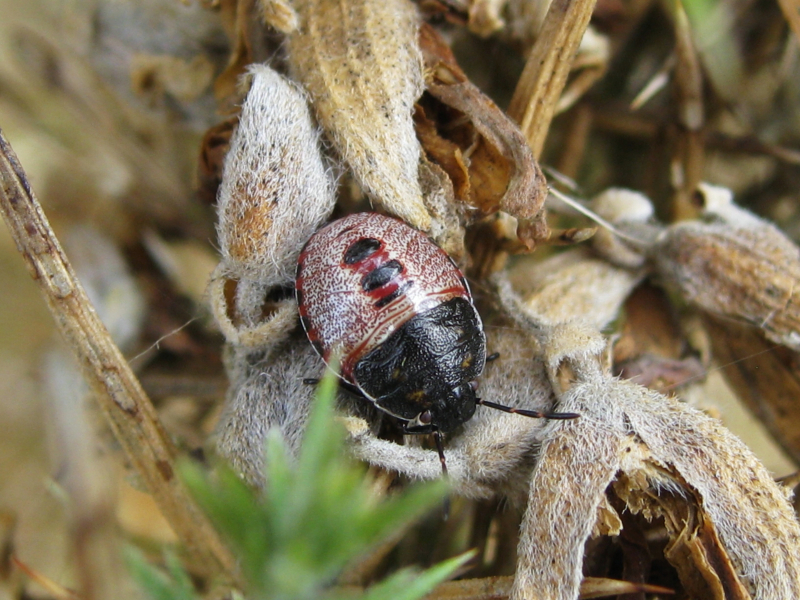 They hide during the day in a silken retreat constructed in the seed-heads of plants. Their web is built nearby between grasses or in low shrubbery, and is remade in the evening. The male and female live together during the mating season in autumn and spring. The female produces 3 - 5 yellow egg sacs during the summer. These vary in colour from pale yellowy-brown to very dark brown. 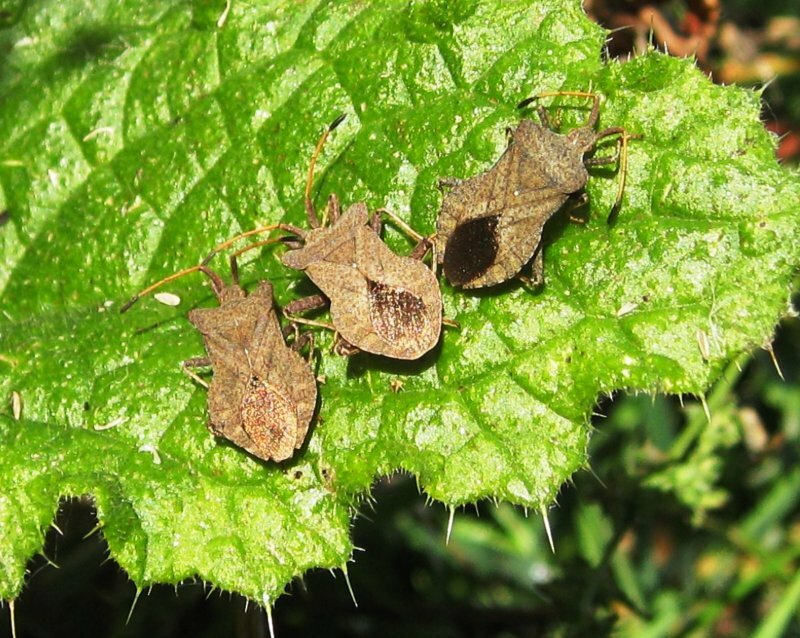 All have a white cross-shaped group of spots on the abdomen. 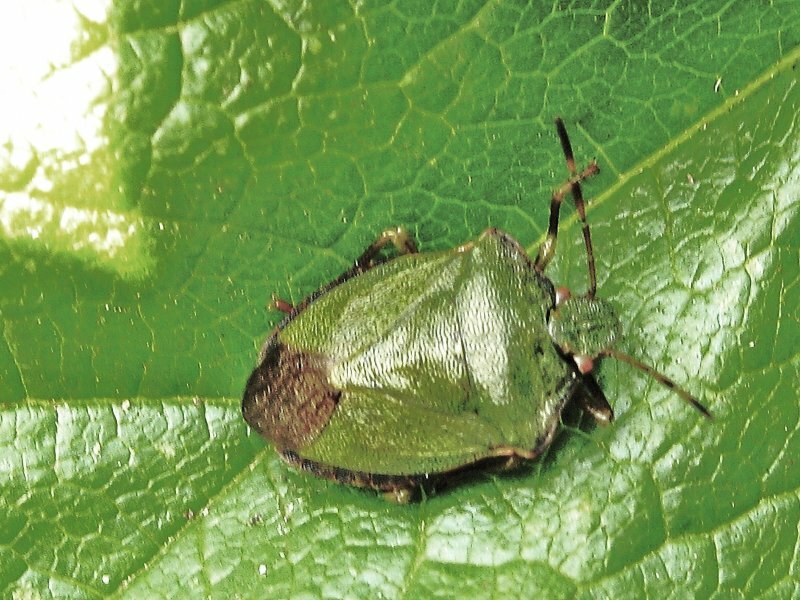 They are seen from May to November on bushes and vegetation. After mating, the female builds a silken cocoon in which she lays her eggs. 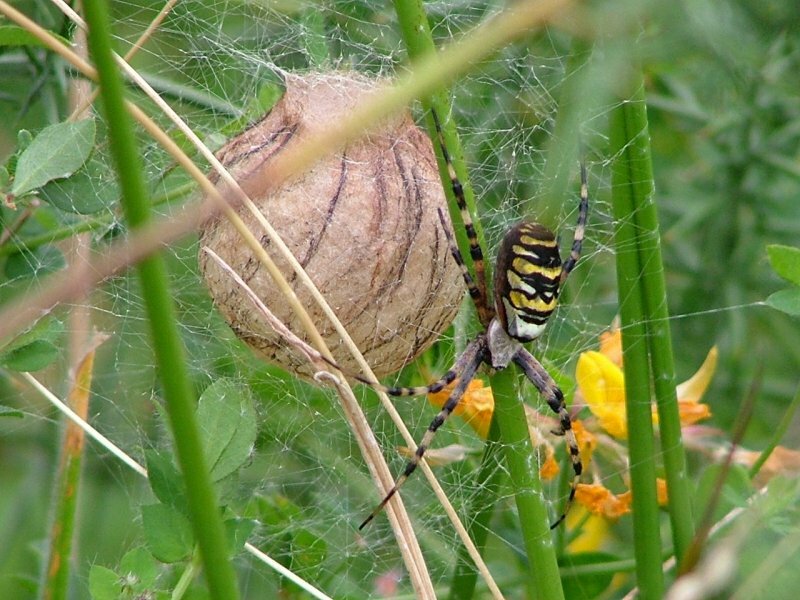 She protects this egg sac till she dies in late autumn. 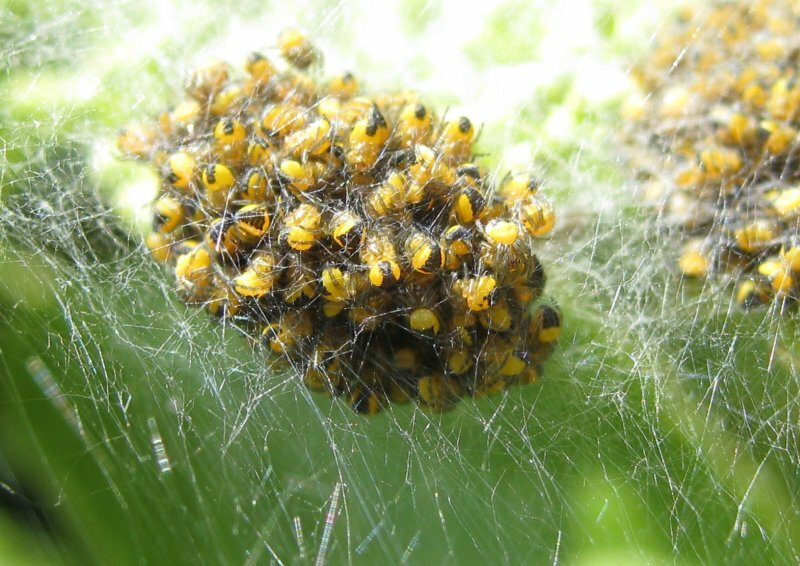 The spiderlings hatch the following May. 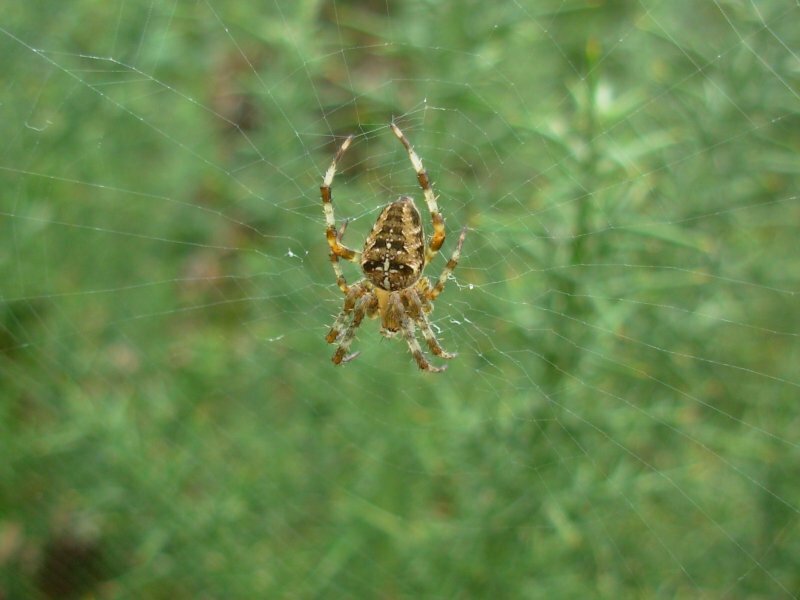 The most common of British spiders – found in gardens as well as the countryside. 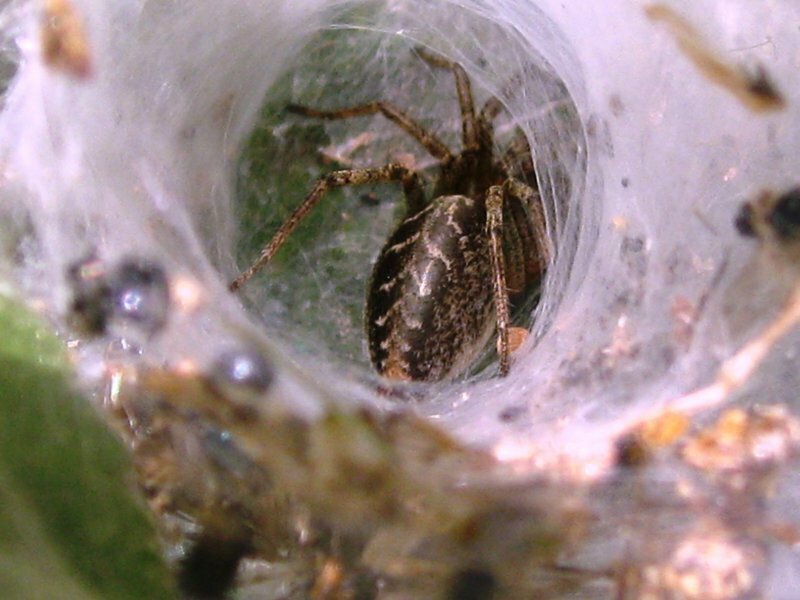 The spiderlings hatch within the nest web and resemble the adults in colouring. They stay together for a few days before dispersing. 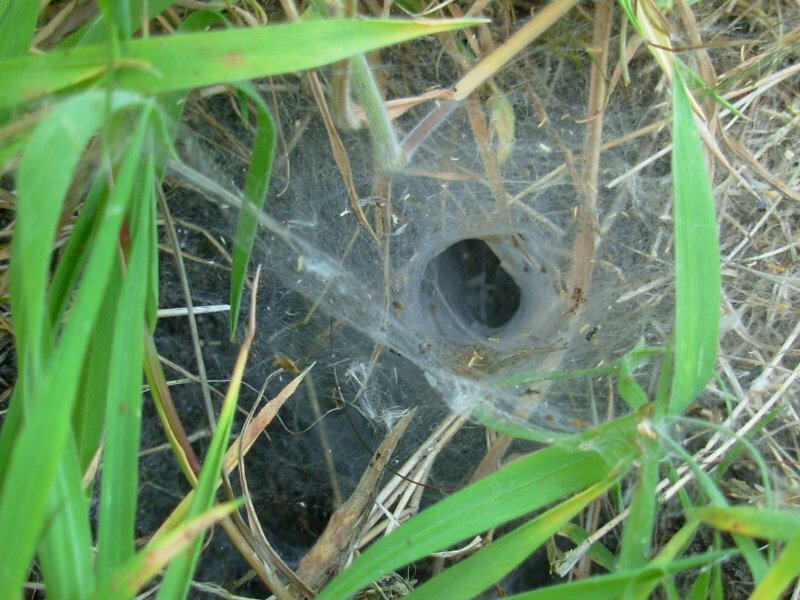 The young are able to construct a web – orb-shaped – within a couple of months, but do not grow to full size until very late summer. 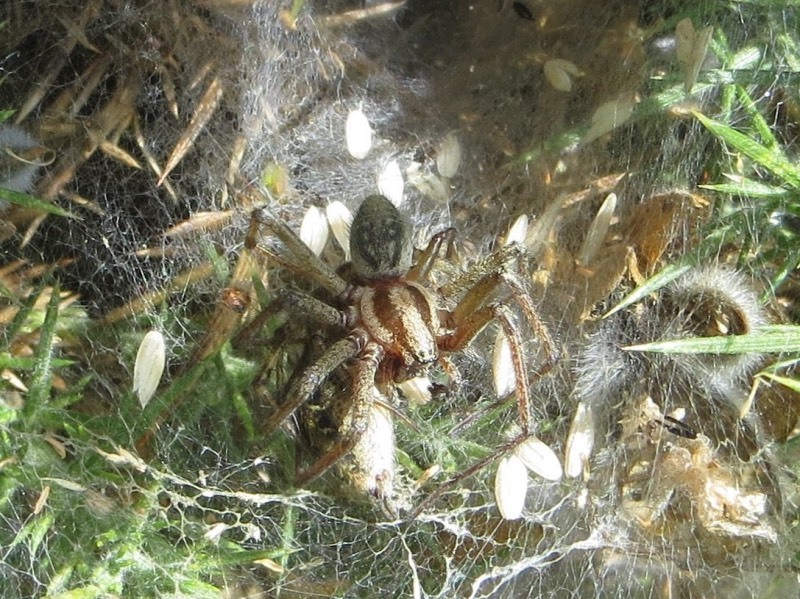 This spider is known as a 'funnel web' spider and spins its web in low vegetation and bushes. The web is of a large volume with a tubular retreat open at both ends. The egg sac is built at a greater height and consists of an inner sac suspended by thin supports in a larger bag. Both are white. The female remains on guard in the ‘labyrinth’ and dies there. It is common and widespread. Found in North Scrubs. 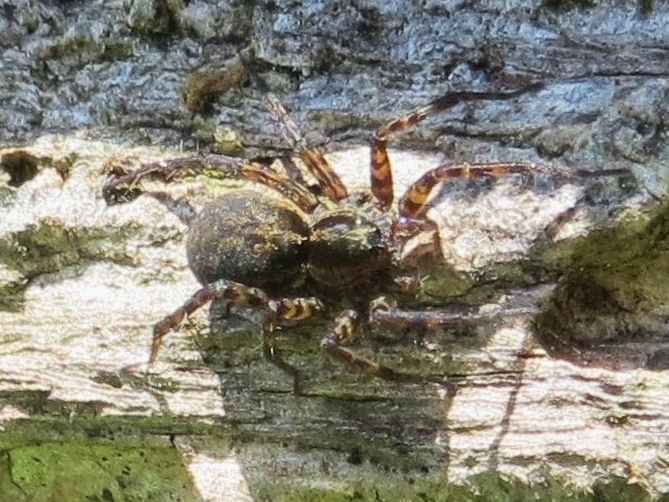 This is a fairly large spider and can be seen in most habitats - including marshy areas! It can be seen carrying an egg sac underneath its body, prior to building a web structure over vegetation as a nursery for the spiderlings. It does not build a web to catch prey, but is a ground hunter. 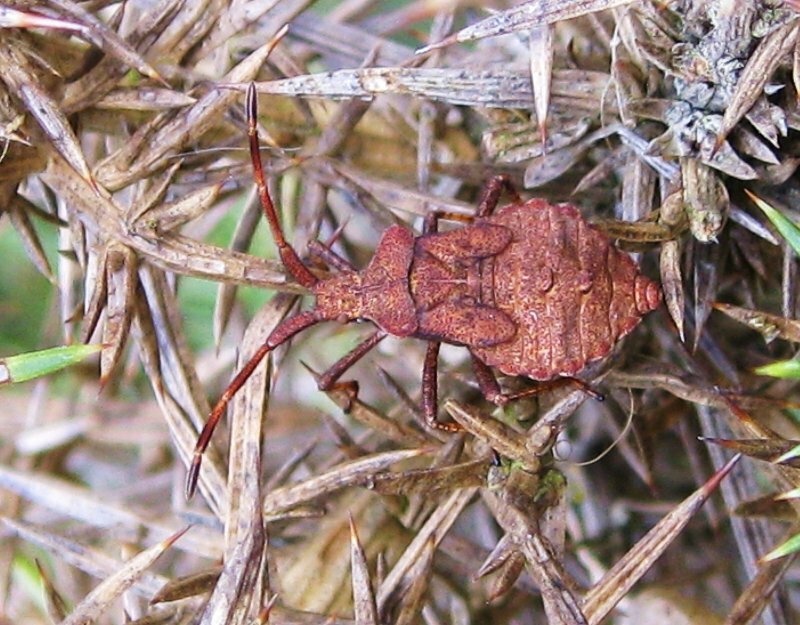 Although an introduced species (by accident during the 60’s) it is fairly common now all along the south coast. It is completely harmless to humans, despite it’s wasp-like colouring. It builds a strong orb web, with a distinct zig zag stablimentum through the centre. It’s nest is a beautifully constructed pot-shape, and the offspring spend the winter in this pot mainly in the egg form – emerging as spiderlings in early spring. 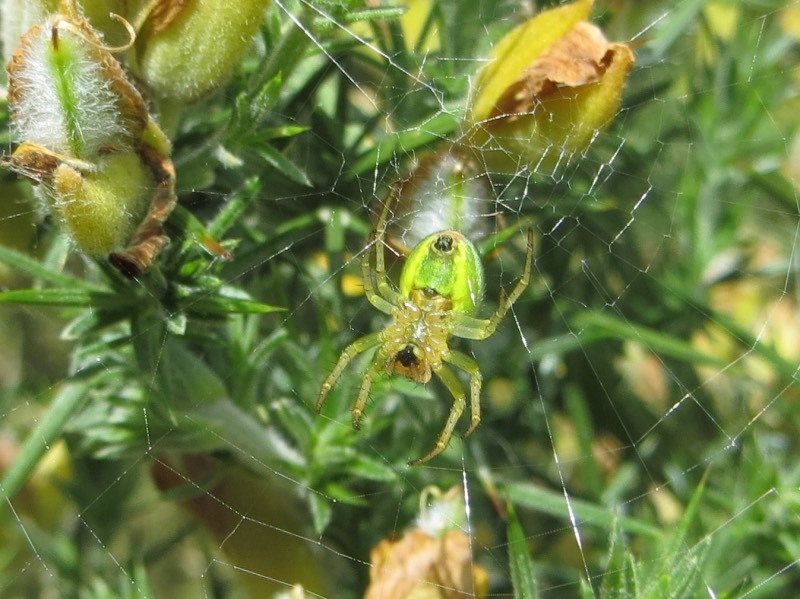 They are ground feeders until reaching adulthood in August when their webs are visible. Wolf spiders are not web builders.They are robust, agile hunters with good eyesight, hunting by day, eating 5-15 small insects a day, and hiding at night under stones etc. Most have no permanent homes, although some do make a burrow. 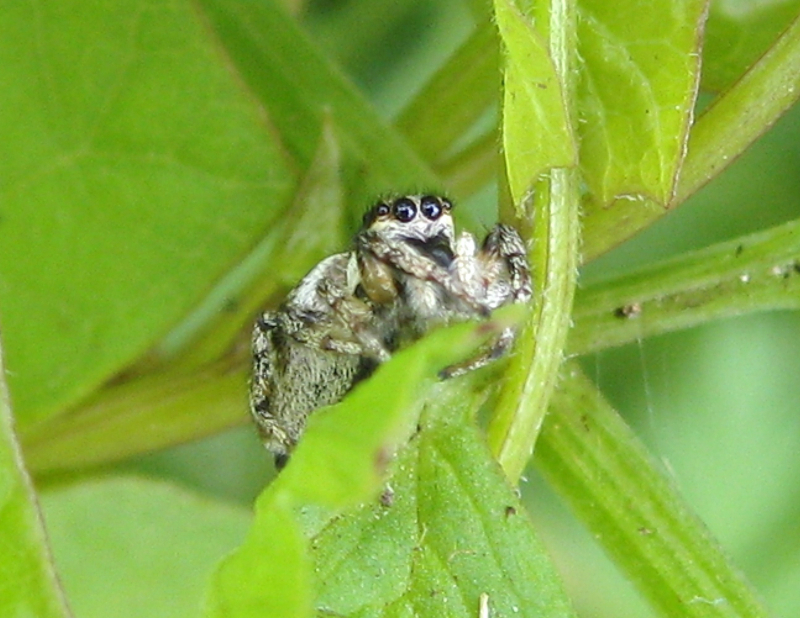 Unlike most other spiders, they are quite gregarious and are often found in numbers. 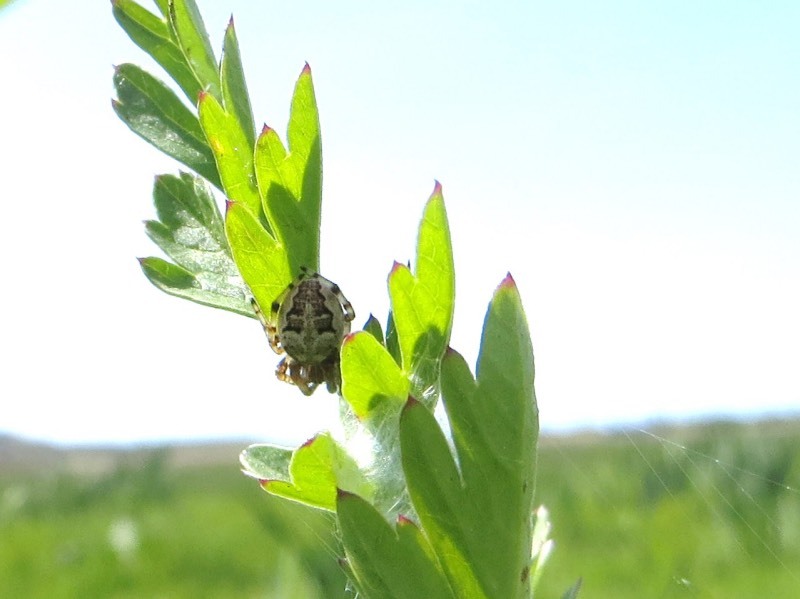 The female uses silk to make her egg sac which she carries around attached to her spinnerets. 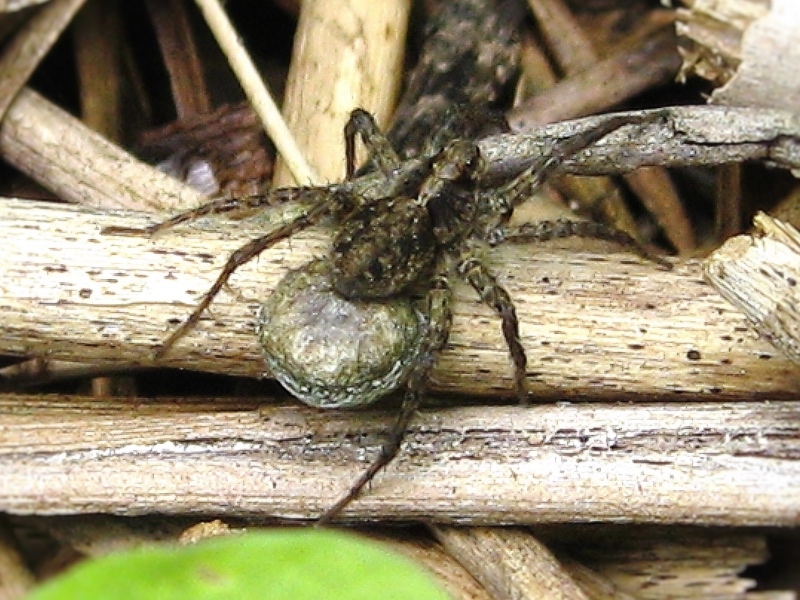 She will tear a hole in the sac when the spiderlings are ready to emerge and will carry them around for a week or so before they disperse.The spiderlings disperse aerially, so Wolf spiders have a wide distribution. Found on a plant bordering the main entrance pathway. Also known as jumping spiders. They have 4 pairs of eyes, the 2 large black ones in the front being the most distinctive and prominent. They pounce and capture their prey – insects. Before jumping, however, they glue a silk thread to the surface they are jumping from, so that if they miss the prey they can climb back up the thread. They are particularly noted for noticing humans, when they raise their heads in recognition. 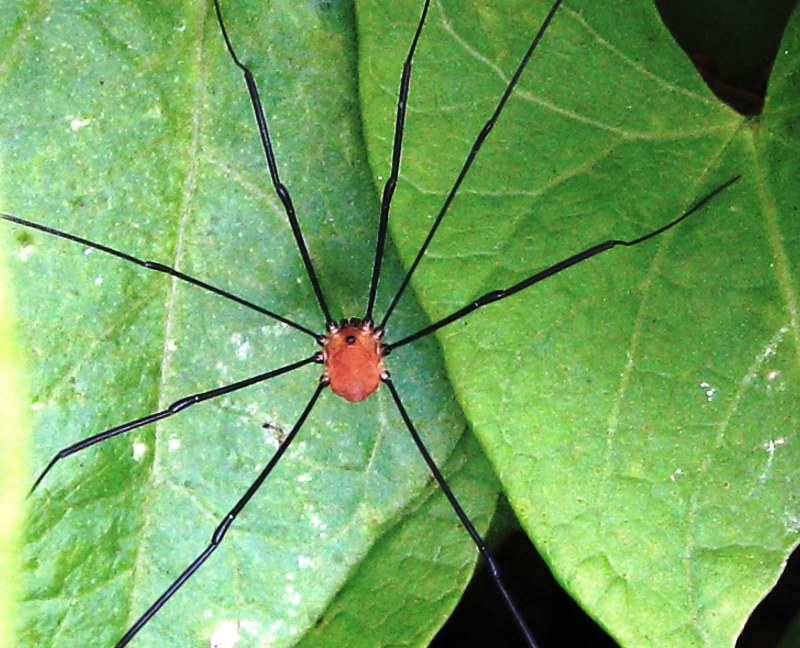 Harvestmen are an order of Arachnids but are not Spiders. 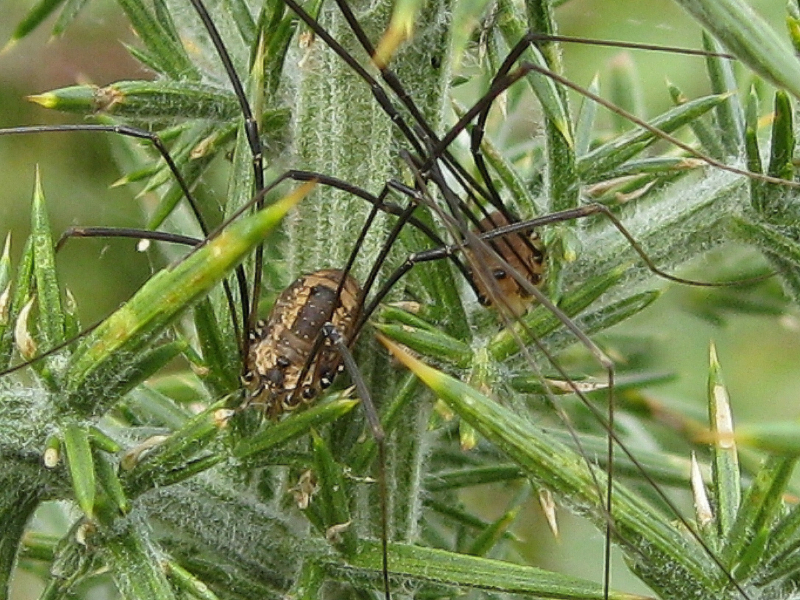 They are known as Opiliones. They only have two eyes, a one-piece body, and have no venom or silk glands. 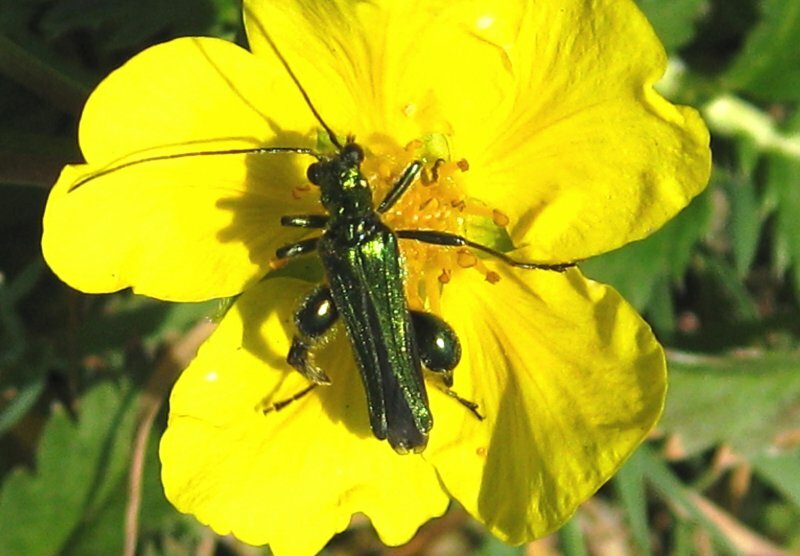 Its habitat is meadows, bogs, forests, fields, gardens, hedgerows and walls. It is mainly carnivorous and can catch small insects with its long legs. 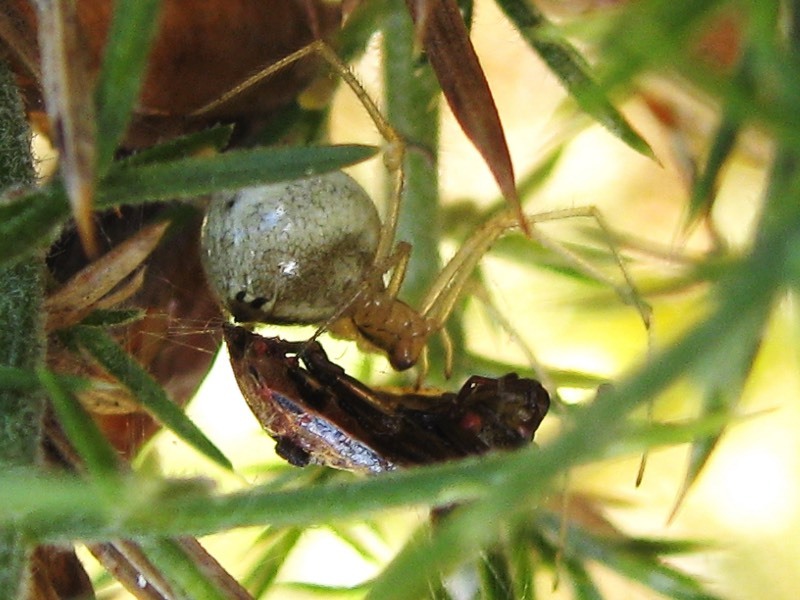 The males have large fangs and fight other males over the females. After mating the male must scurry off or the female will not hesitate to eat it. They lay 50 to several hundred eggs in soft soil or moist places. 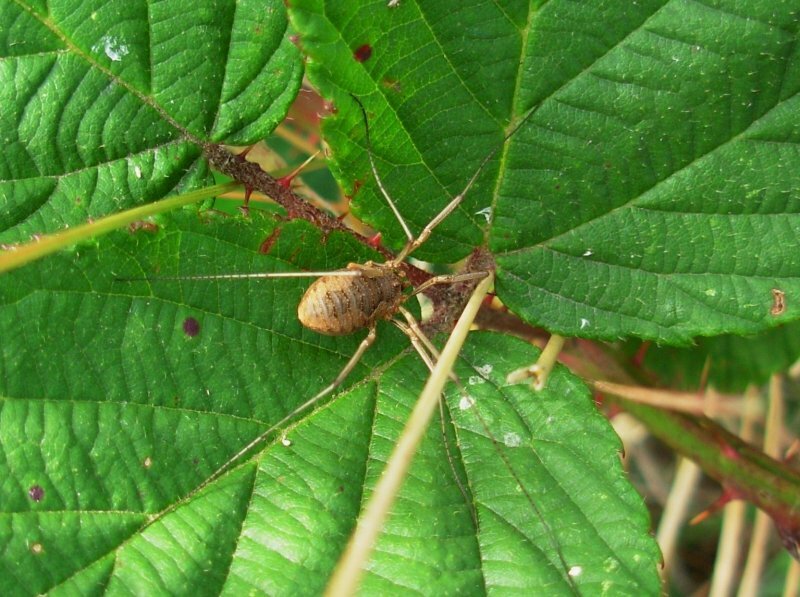 This is also one of the most common of harvestmen, and like the Phalangium opilio, feeds on invertebrates, dead or alive. 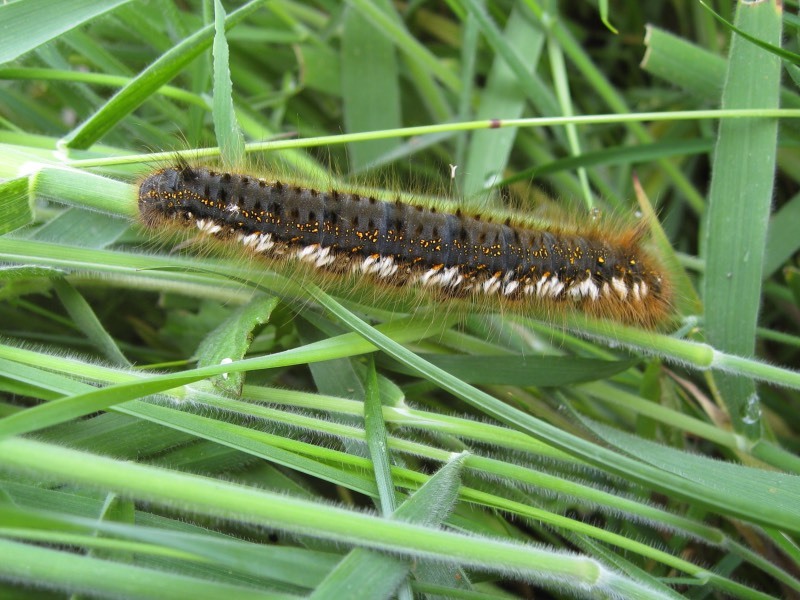 These include caterpillars, mites, woodlice and slugs. 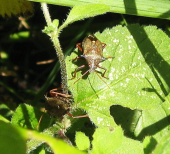 Harvestmen also drink a lot of water, esp. dew. Eggs are laid in crevices in the soil, and hatch out in the spring.